Last winter I went to Qadian with my family. 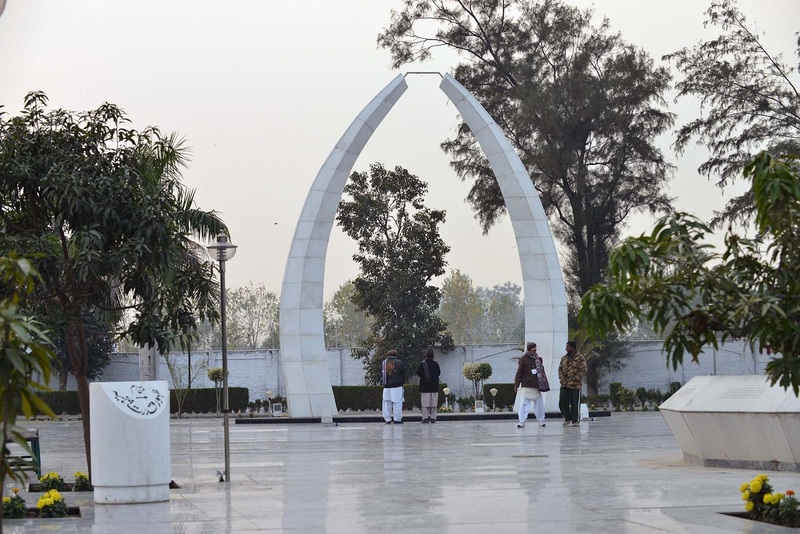 We went to India through the Wagah Border from Pakistan and we then took a taxi from Amritsar to Qadian. It was my first ever time going there, and I was very excited. When we got there, we were very lucky to be staying in Darul Masih which was the home of the Promised Messiah (as) and his family. From our room we had an amazing view of Minaratul Masih. On our first day we had a tour of Darul Masih which included: Masjid Mubarak, Masjid Aqsa, the room where the Promised Messiah (as) was born and other famous places in the history of Jama’at. Every day we would go to Bahishti Maqbara to pray at the grave of the Promised Messiahas and his companions. Every evening, I would go and offer nafl prayer in different places in Darul Masih with my mum. Our last three days in Qadian were the three days of Jalsa. On each morning of the Jalsa we would walk from Darul Masih to the Jalsa Gah with some of our family members. 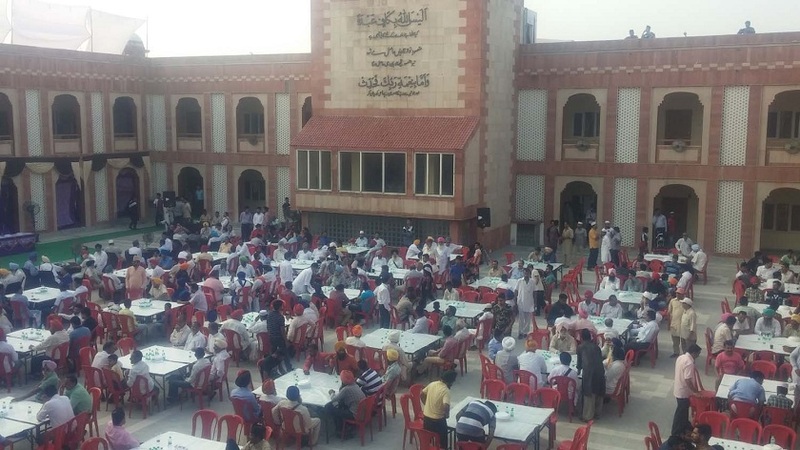 The Jalsa gah in Qadian is a little different to the one in England because in Qadian it is in the open air and it is cold because as Jalsa is held in the winter. In England the Jalsa is held in a huge marquee and as Jalsa UK is normally held in the summer it tends to be very hot. 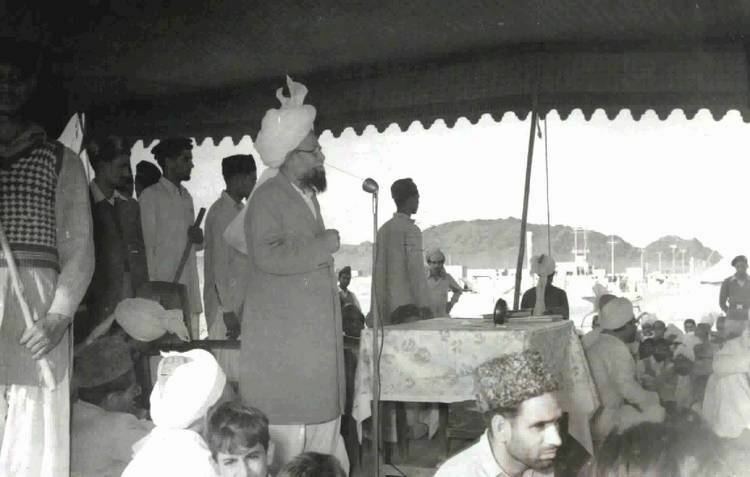 There were however a few things that were similar to the Jalsa in England – for example, both Jalsas are for three days, they have speeches and nazms and you have to have your badges scanned and your bags checked. Because it was the winter, we had to wear hats, scarfs, gloves and coats as unlike the Jalsa in England it was freezing (we even had to wear these when were asleep as it was so cold!). For each day of Jalsa, my cousins and I would bring massive goodie bags and we used to share all the drinks, fruit, chocolate and crisps between us. In the evenings my family and I would go to the bazaar to buy ourselves some treats. I had an amazing time in Qadian and I hope to be able to go back again soon, inshAllah. On 19th July, I went to Pakistan with my family. I was very excited about this trip, as I have many relatives who live in Pakistan. My first stay was in Chawinda stayed with my relatives there. We also went to Sialkot. 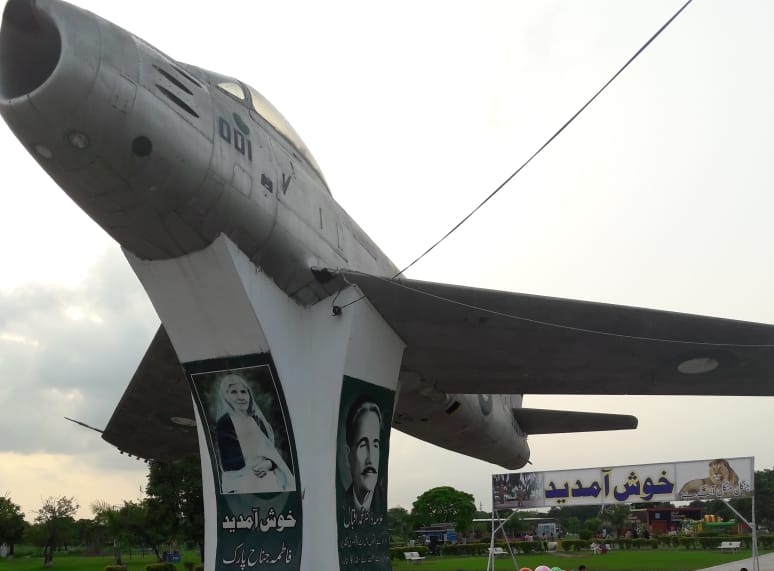 Sialkot is home to a beautiful park. It had all types of rides, types we would normally not see here in England. Playing at the park with my sisters was fun, we played for a while before my parents decided that it was time to say farewell to this beautiful park. We also went to Gujranwala. Gujranwala is the city where my father used to live in Pakistan. It was exciting visiting the place where my father used to live. Rabwah is a city built by our jama’at, founded by Hazrat Musleh-e-Ma’ood (ra). Rabwah demonstrates a city of peace filled with the motto,” Love For Allah, Hatred For None”. We visited places such as Darul-Ziafat, which serves as a guest house, serving accommodation and meals. I really enjoyed exploring these new places. After, we went to Bahisht-e- Maqbara for prayers. Then we visited Gol bazaar for some shopping. We also visited Tahir heart institute, which is one of the leading hospitals in the world, caring for people from all walks of life. I loved going to the places in Pakistan. I wanted to stay there for a long time but obviously I couldn’t. In England there are fun places but I would recommend Pakistan to people. It’s a fantastic place to be. There were lots of other places we went, such as: malls, bazaars, restaurants and much more. My family enjoyed Pakistan. Though I have to admit Pakistan is not like England. England is always freezing and gloomy but Pakistan is a sunny, bright place. I’m sure anyone who goes there will agree with my point of view. 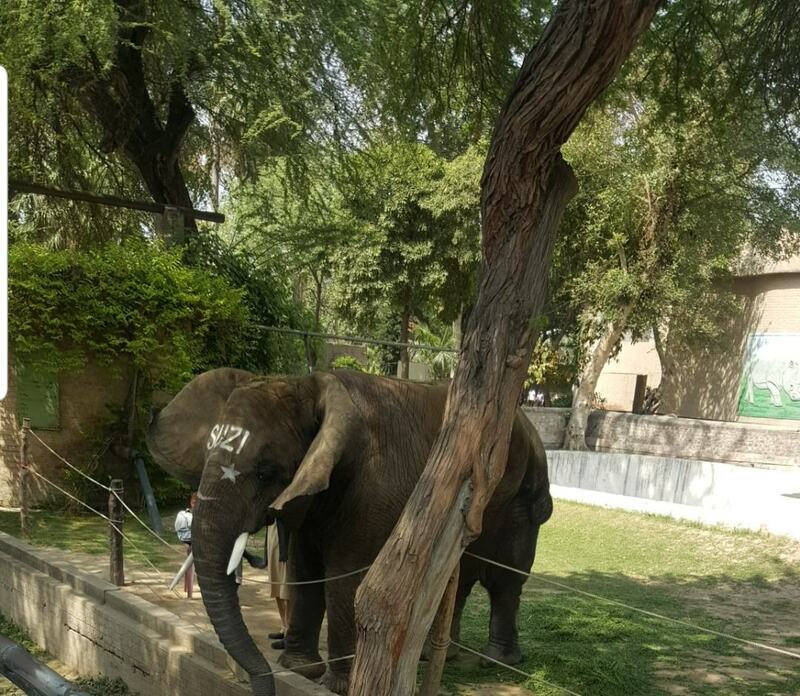 In Lahore we visited safari park. It was so much fun. There were lots of animals. 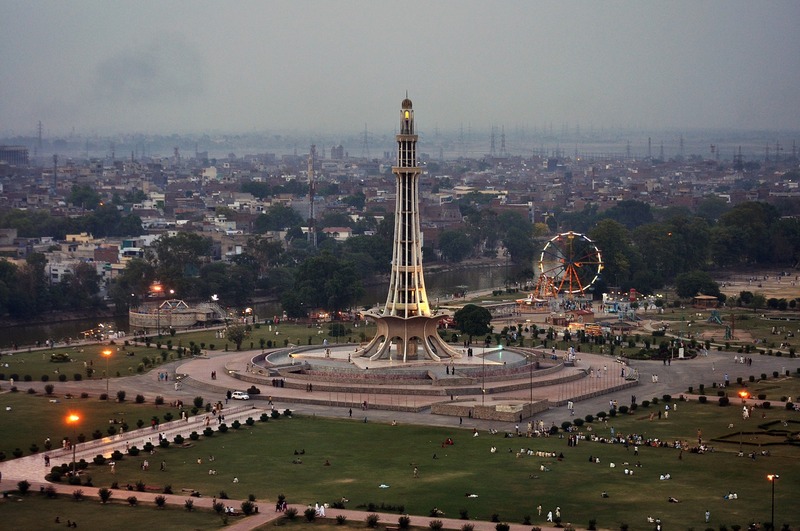 Another day we went to Minar-e-Pakistan. There was a tall building there. There were also decorated buggies. We also sat on a boat. 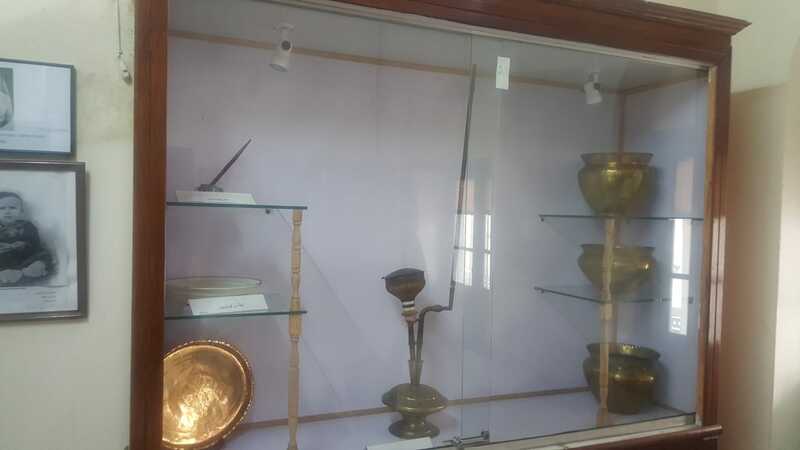 We went to Allama Iqbal sialkot house there were loads of memorable things like beds, rooms, books and much more. I would love if other people visit Pakistan. He was born in 1835 in Qadian, India. 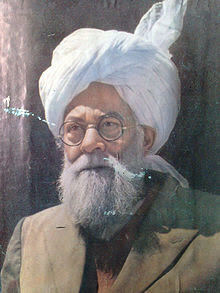 He was from a noble family, land owning family of Qadian. He was educated mainly at home by various tutors as was usual at that time. His education mainly consisted of reading in Persian and Arabic, becoming relatively fluent in the former. He had a very deep love for the Holy Qur’an and for prayer. Most of his time was spent on learning the Holy Qur’an in depth and studying other religions. 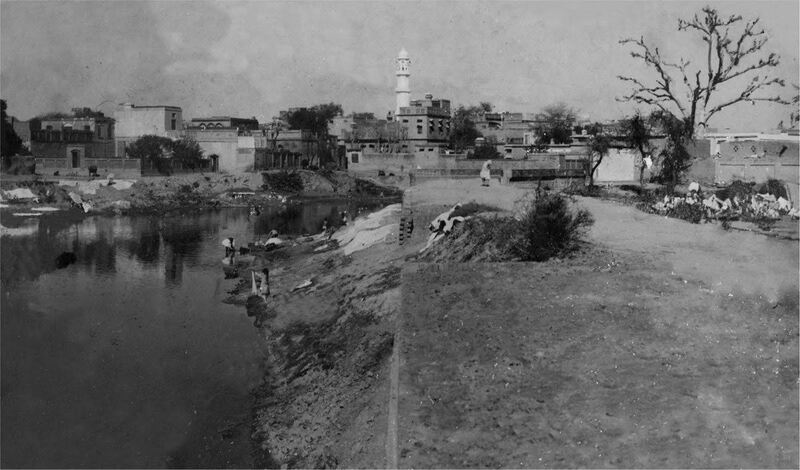 In 1835 Qadian was a small, dusty village situated in the district of Punjab in India which was very hard to reach. 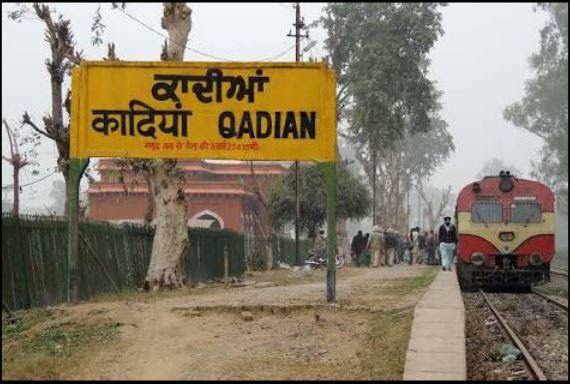 Not many visitors came to Qadian, nor was there a train station at that time. 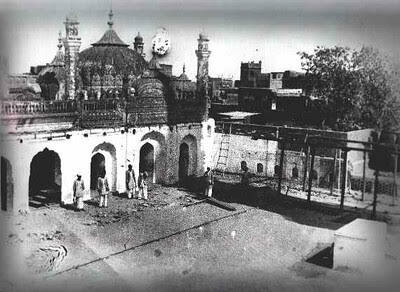 Over time, many left their homes and their belongings, which were sometimes quite affluent, to go and live in the small unknown village of Qadian in India, which for them appeared to be in the wilderness, separated from any main town or transport provisions by a day’s journey. 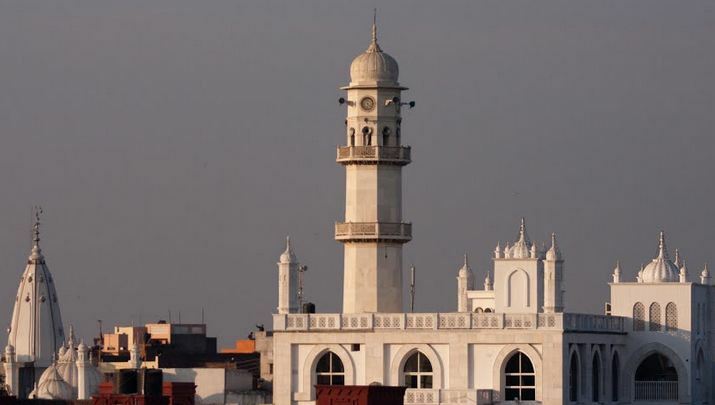 Now Qadian is a large town with schools, offices and a train station. Many visitors come every year to visit the birthplace of the Promised Messiah (as). 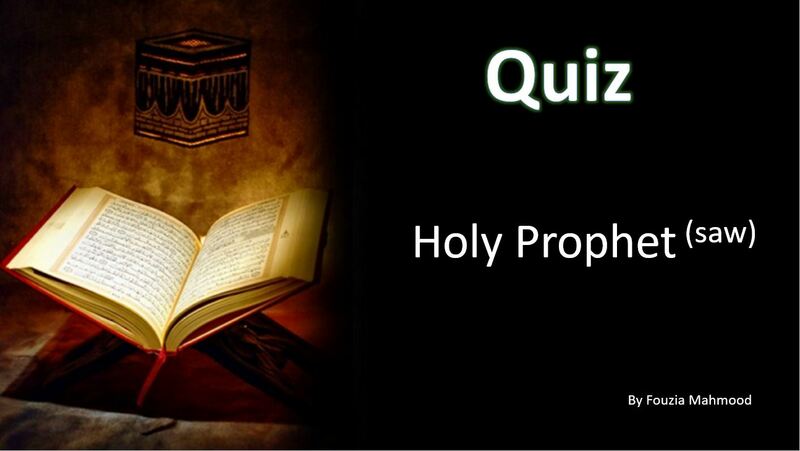 “One day we were sitting with The Holy Prophet (saw) when this chapter was revealed. I enquired from Muhammad (saw), who are the people to whom the words and among others f them who have not yet joined them refer? 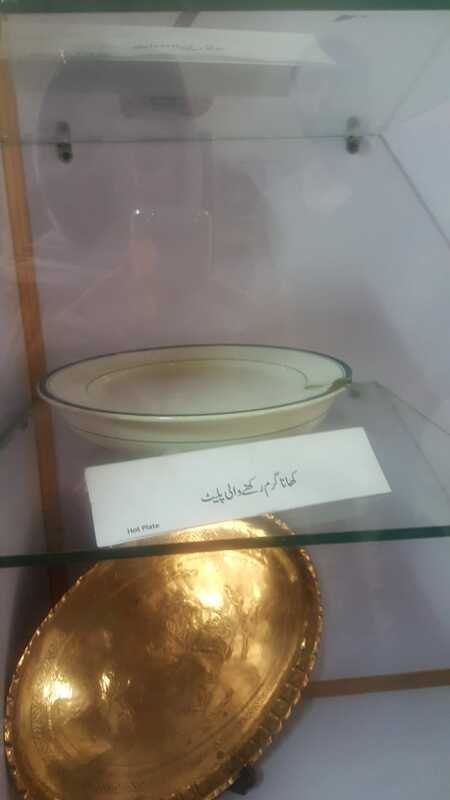 Salman (ra), a Persian was sitting among us. The Holy Prophet (saw) put his hand on Salma (ra) and said ‘If faith were to go up to the Pleiades, a man from among these would surely find it.’” (Bukhari). 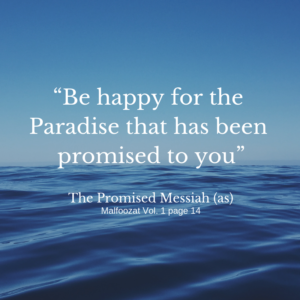 The Promised Messiah (as) received many revelations from Allah. 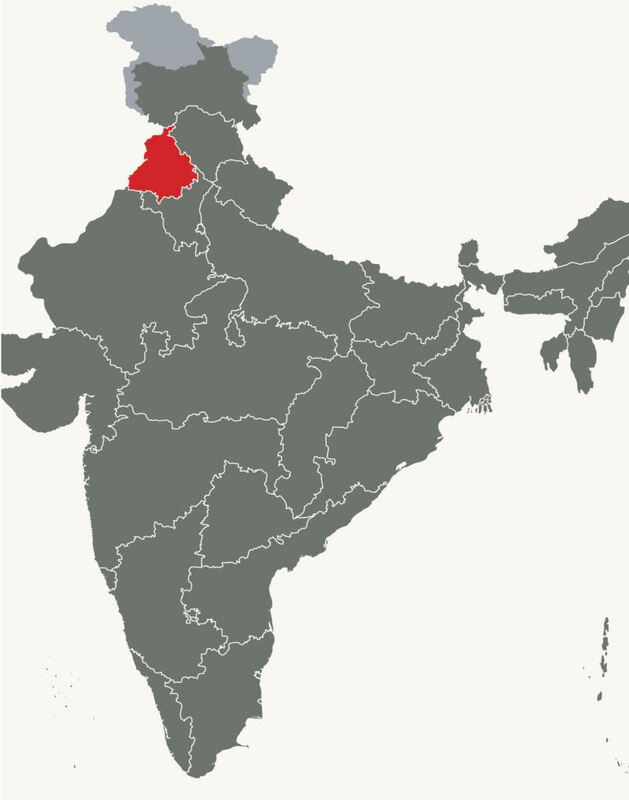 The first was in 1868/9. He defended Islam from many false allegations and spoke and wrote about the beauty of Islamic teachings. 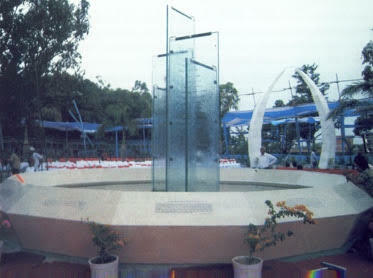 He took the first bai’at – the pledge of initiation – from people on 23rd March 1889. He wrote more than 80 books. Hazrat Musleh Ma’ood (may Allah be pleased with him) said that at daybreak Ahmadis used to wander around with keen expectation wishing to find out what revelation had been received the night before. They would ask whichever of the Promised Messiah’s children they saw about this. 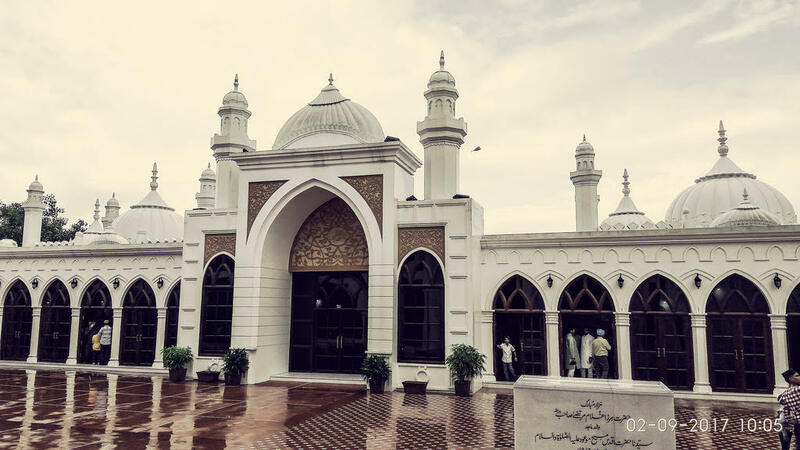 Hazrat Musleh Ma’ood says he and his siblings too would quickly look at the Promised Messiah’s notebook as soon as he left for Salat to see any revelation noted down or they would hear about the revelation in the mosque from his blessed mouth. Thus, was the zest to strengthen faith, glorify and thank God for enabling to accept the Promised Messiah (on whom be peace). The Promised Messiah (on whom be peace) used to relate that a gardener’s wife had two daughters. One was married in a family of potters and the other in a family of gardeners. Each time it became cloudy she would panic and say one of her two daughters would suffer. On asking she would explain that if it rained the daughter married in potters’ family would suffer and if it did not rain the daughter married in gardeners’ family would suffer. It is rained the clay pottery of the first daughter would be damaged and if it did not rain the gardens tended by the second daughter’s family would be affected. 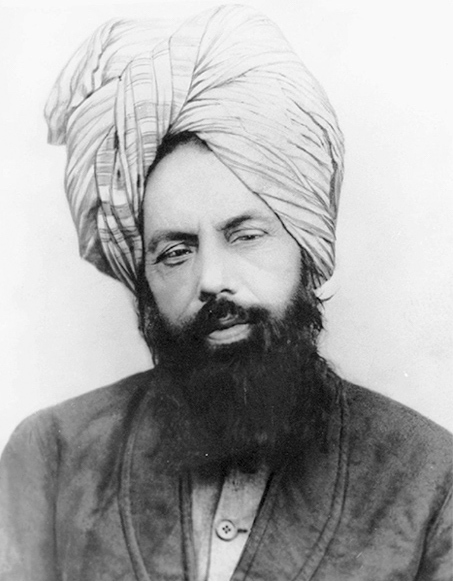 Likewise, the Promised Messiah (on whom be peace) related that two individuals from Qadian had some dispute. Their friends tried to reconcile them but they both insisted to take the matter to the court run by the British. They were both followers of the Promised Messiah (on whom be peace) and they both requested him to pray for them. Faced with a dilemma the Promised Messiah said he prayed that may the one who is on truth win. Requesting prayers in this way is like the story of the mother who feared that rain or no rain would affect one or the other daughter of hers because someone had to lose out! In talking about the Promised Messiah (peace be on him) and his daily routine Hazrat Musleh Ma’ood (ra) says that The Promised Messiah (peace be on him) worked hard to maintain his health and to keep his body very active. He was not lazy or inactive at all. Instead, he was very hard working and very much liked to be in seclusion. He did not ever shun the hard work and many times it happened that whenever he had to go on a journey then the horse was sent by the servant ahead of him and he used to walk on foot, sometimes covering 20 to 25 miles he would reach the destination. Rather many times he used to travel on foot and very rarely he would ride at the back of the mount. This habit of walking on foot remained till the end of his life and when he was over 70 years of age with a number of diseases, yet he used to go out for fresh air and walk about 4 to 5 miles, even up to 7 miles. 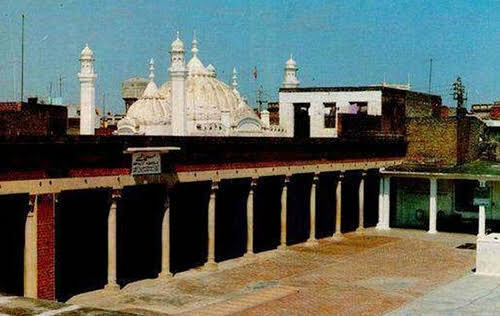 He used to mention that at the time before his old age he used to get up early before the Fajr prayer and would undertake a walk from Qadian to Wadala. While on the walk, the call for Fajr prayer used to happen at around 5.5 miles of the journey near a village where he used to offer the supplication. 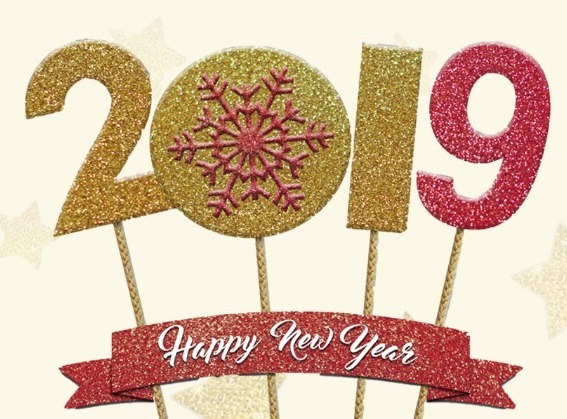 Thus, “this verse clearly indicated that in the future other noble persons would be sent by God Almighty to bring mankind back towards His Creator. When this verse was revealed, one companion, Abu Hurreira, repeatedly enquired from the Holy Prophet (pbuh) as to whom the words “who have not yet joined them” referred? Another companion, Salman, who was from Persia, was also sat in the gathering. When answering Abu Hurreira’s question, the Holy Prophet (pbuh) placed his hand on Salman’s shoulder and said: ‘If Faith were to go up to the Pleiades, a man, or men, from among these would surely bring it back’ (Sahih Al Bukhari). “The Holy Prophet (pbuh) had thus explained that a time would come when the beautiful religion of Islam would become corrupted and defaced. At that time God Almighty would not stand by, but due to His Infinite Love, he would instead send people from amongst the Persian race who would reform Islam and once again spread the true teachings of the Holy Prophet (pbuh). The ultimate fulfilment of this verse came in the person of the Promised Messiah (as) who was sent as a Prophet by God Almighty to rescue Islam from evil forces both within and out of Islam. 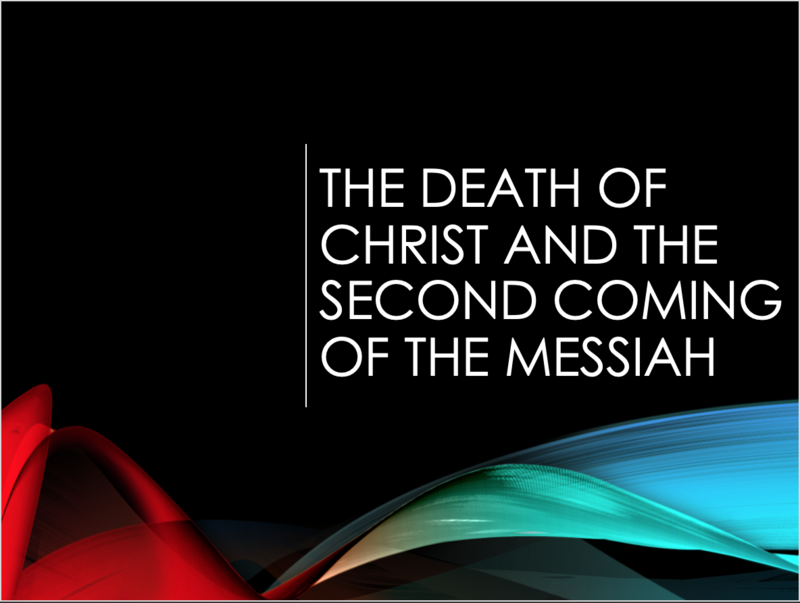 However, the Promised Messiah’s(as)advent did not herald the completion of the prophecy. On the contrary, because God Almighty had clearly used the words ‘among others of them’ in the verse, Allah had clearly signalled that He would send more than one person. There is no doubt that Hazrat Mirza Bashir-ud-Din Mahmood Ahmad (ra) was also sent in fulfillment of that grand Qur’anic prophecy. Among other things, this is evidenced by both the events surrounding his birth and his vast achievements in the cause of Islam.” (The Promised Son by Abid Khan). The Promised Messiah (as) wrote an announcement in relation to the prophecy revealing the birth of ‘the Promised Son’ on 20th February 1886. This was published in a local newspaper known at the time as ‘Riaz-e-Hind,’ dated 1st March 1886. It is, however, essential to note that this was not on a green paper neither was its later developed publication in the form of a leaflet printed on 22nd March 1886. This leaflet included specific details on the divine prophecy for the understanding of both opposers and believers. For example, it highlighted that the birth of the Promised Son may occur at any point during the period of 9 years. What followed that was a phase of ridicule and criticism by opponents of all faiths against the Promised Messiah. This was because, after the announcement of the prophecy a daughter named Ismat was born on 15th April 1886 followed by the birth of Bashir (the first) who passed away shortly after 16 months on 4th November 1886. As a result, opponents mocked and questioned the prophecy and its divinity. However, despite criticism from all corners, the Promised Messiah spent this time of pain and anguish with utmost humility, patience and in the remembrance of his creator. We learn therefore that the extent of patience and steadfastness exhibited by the Promised Messiah(as) was essential to awaken an understanding of patience in the hearts of Momins (believers) at the standard that their creator wills. The death of this Son allowed people to question the revelation as it had claimed that the Promised Son would have a long and fulfilling life who would live to serve his faith. The Promised Messiah in response explained that he had not had a clear sign from Allah that this son would be the same Promised Son upon whom he had previously received the revelation and neither had he claimed that the first-born child would be that child. On 12th January 1888 around 10 o’clock in the evening, Allah the Almighty miraculously fulfilled this prophecy through the blessed birth of a son showing the Promised Messiah clear signs that this is the Promised Son in accordance to that prophecy. The Promised Messiah(as) announced the birth of the promised son in ‘Siraje Muneer’. Moreover, Hazrat Musleh Ma’ood (ra) truly possessed all the qualities clearly mentioned in the prophecy. He was blessed with a long and fulfilling life and befitted all the names that were given ‘such as Mubashir [the Promised One], Bashir [Bearer of glad-tidings], Nurullah [Light of Allah] Sayyeb [Heavenly Rain], Charagh Din [Light of Faith] etc., which reveal his perfect potential and inherent light. 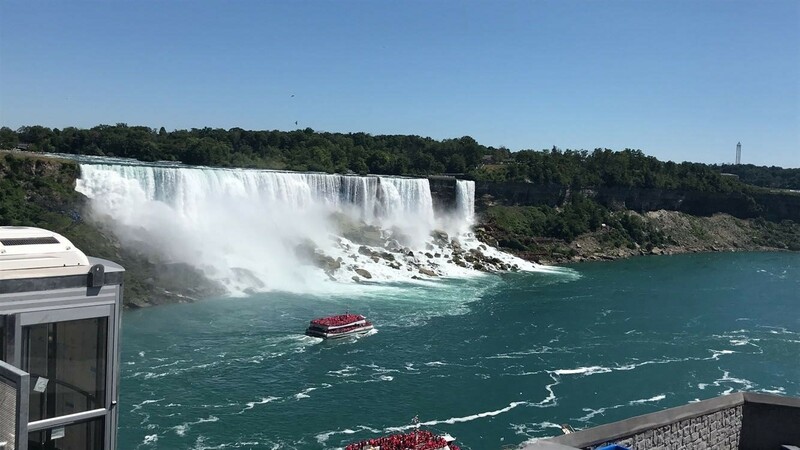 In the previous Travel blog, a dear sister described the mesmerizing views of Niagara Falls. In this post, I aim to do something similar and travel through various places in the province of Ontario, Canada. I assure you, just like post 1, this post will pursue you and your parents to book an immediate flight to Canada! On June 4th, 2018 I traveled to Canada. I am very fortunate that I have a lot of relatives who live in Toronto, Canada. So, the accommodation was not a worry. I stayed with my cousins in Vaughan, which is only a 5-minute drive from the famous Peace Village. 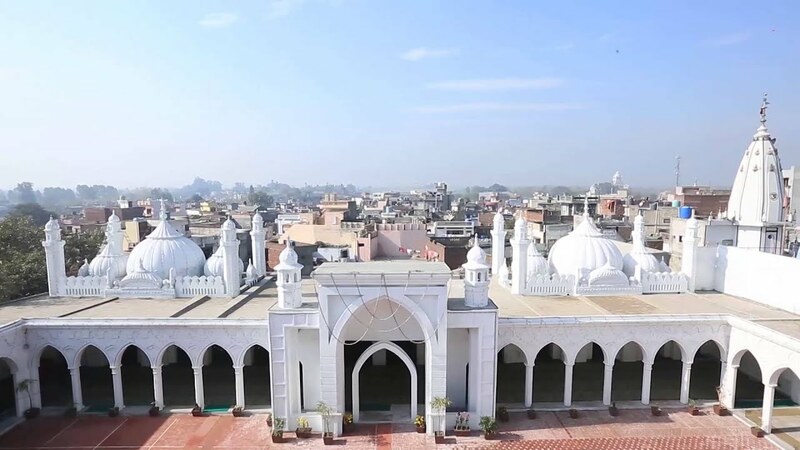 Peace-Village is a faith-based sub-division which provides residence to over 200 houses and is centered by the beautiful Bait-ul-Islam Mosque. 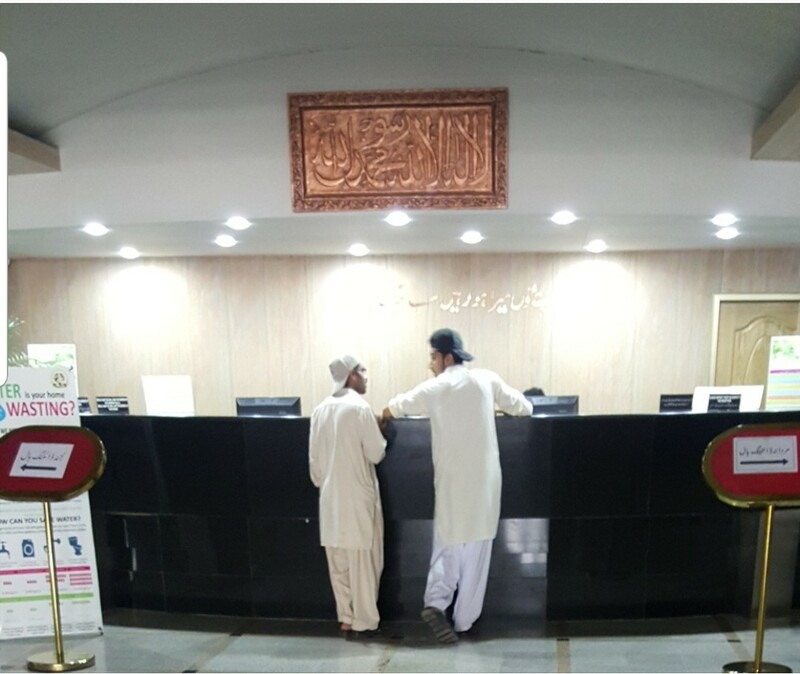 For an Ahmadi who has not had the opportunity to yet see the astonishing beauties of Rabwah and Qadian, seeing the streets of Peace Village filled with greetings of “Assalamo’Alaikum” (Peace with upon you) was an experience worth reviving one’s faith. I had the blessed opportunity to see Beloved Huzoor’s (May Allah be his helper) house which was currently under construction, however still a beautiful sight. Sadr Lajna Canada graciously invited me to Bait-e-Maryam, the Lajna office in Peace Village and gave me a detailed tour of the three-storey office. What a beautiful and well-constructed building with the atmosphere of love and harmony! Reading names of streets such Ahmadiyya Avenue, Bashir street, Mahmood Crescent and visiting a beautiful park named after the late Fazia Mahdi sahiba, all made me realise that by the grace of Allah the Almighty, our community is not only filled with love, respect and honour it has and will insha’Allah conquer the world! Fortunately, my trip to Canada covered the last Asha’ra (Ten Days) of Ramadhan. I was very grateful to be able to regularly go to the Mosque to offer my Salat and listen to Dars leading up to Iftaar and Maghrib prayers. Dars lead by respected missionaries of the community was covered in Urdu and English to accommodate all listeners, and topics were covered in great detail. As per traditions of the Canada Jam’aat, anyone present at Dars is given a pack of dates, a water bottle and wipes to open their fast. Each evening spent in Peace Village during Ramadhan illustrated the truthfulness of Islam Ahmadiyyat. The Spirit of Eid in Canada is extensively celebrated. I saw my cousins making goody bags for friends, cooking extra portions of sawaiyaan (a vermicelli dish), to be distributed amongst family, friends and Muslim and non-Muslim neighbours. Living in London, England I have always been used to the Mosque being full on Eid day. This time, I was excited to see where I would be offering my Eid prayers and how full the venue would be. 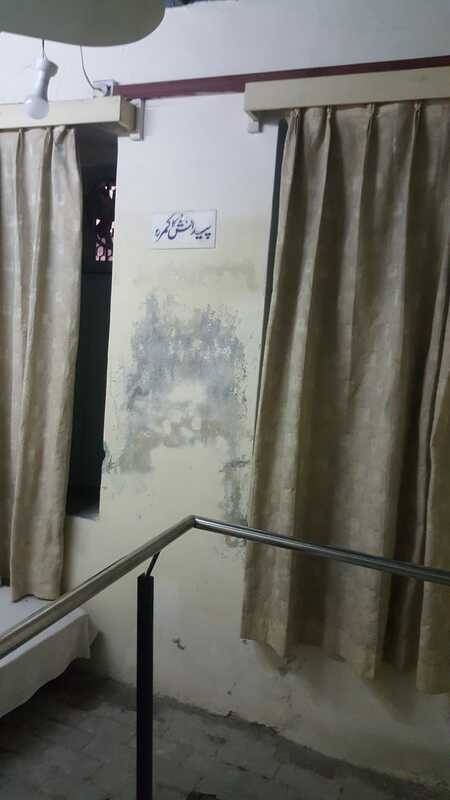 To my surprise, the overflow at Bait-ul-Islam Mosque was very similar to what I had been experiencing back home. 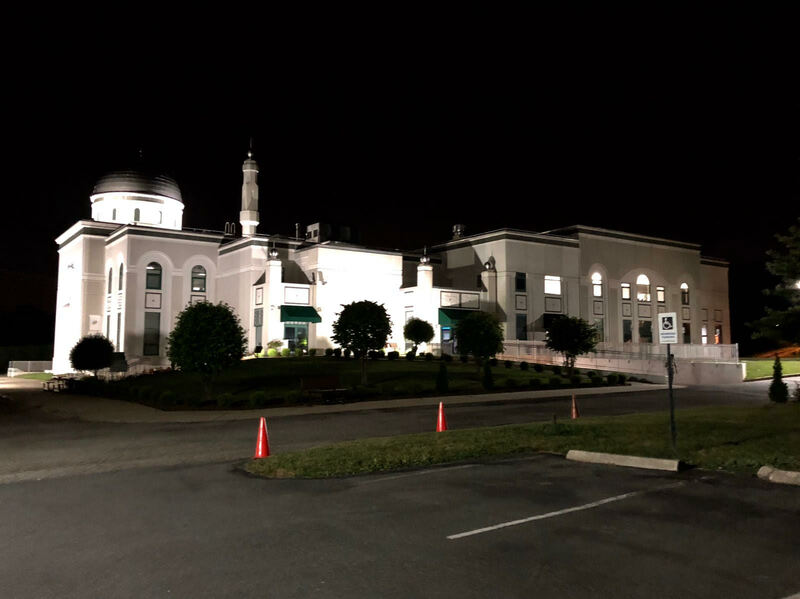 In fact, the large Mosque was unable to accommodate all members of the community and Lajna, therefore, prayed Eid Salat in Tahir hall, a multi-purpose building adjacent to Bait-ul-Islam Mosque. Again the streets of Peace Village echoed “Assalamo’Alaikum” and “Eid Mubarak” as we all headed back home to enjoy the rest of this blessed day. 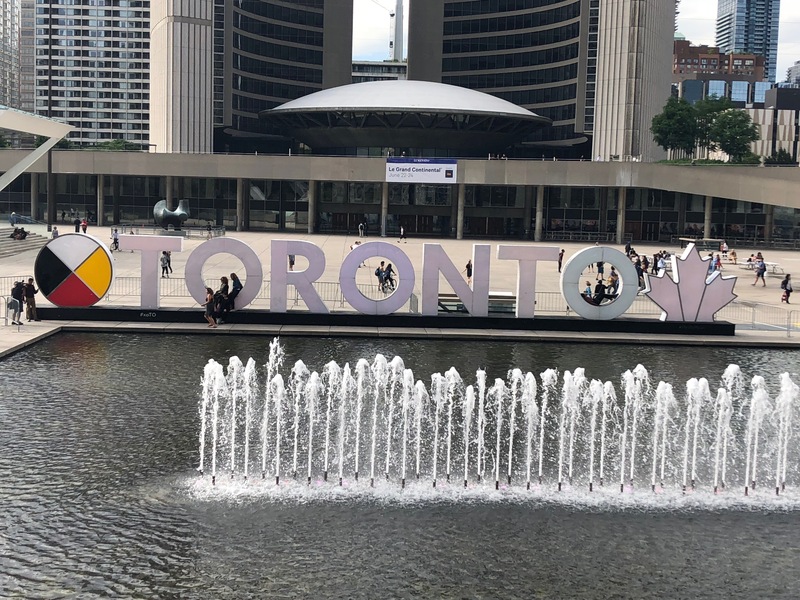 Let’s now move a little out of the city of Toronto. 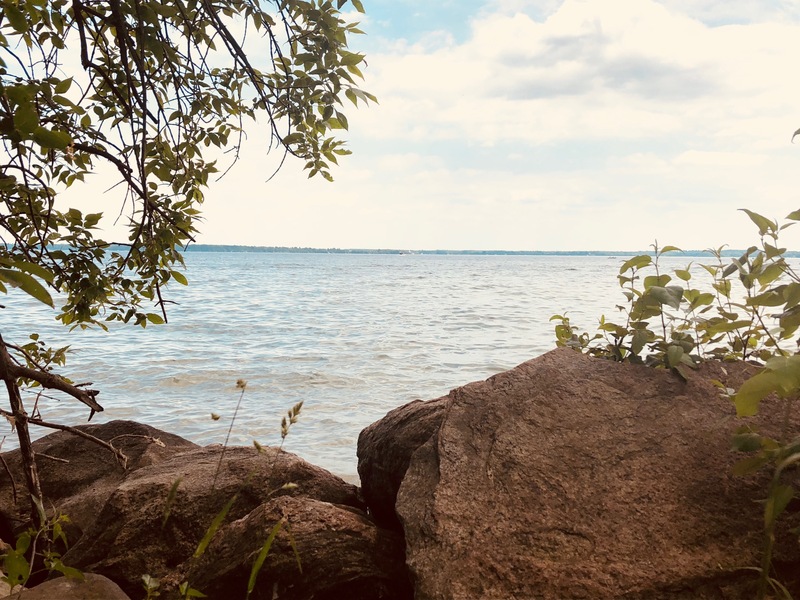 June 17th, 2018, marked itself to be an extremely hot day, so we decided to travel to Innisfil Beach Park in Bradford, Canada. 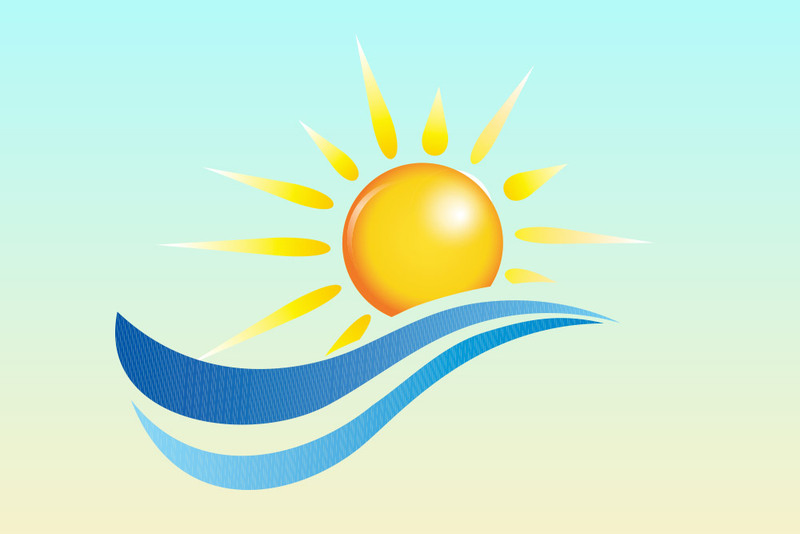 A beach Park, providing access to Lake Simcoe for swimming, boating and fishing. It’s an extremely well-planned structure really caught my eye! 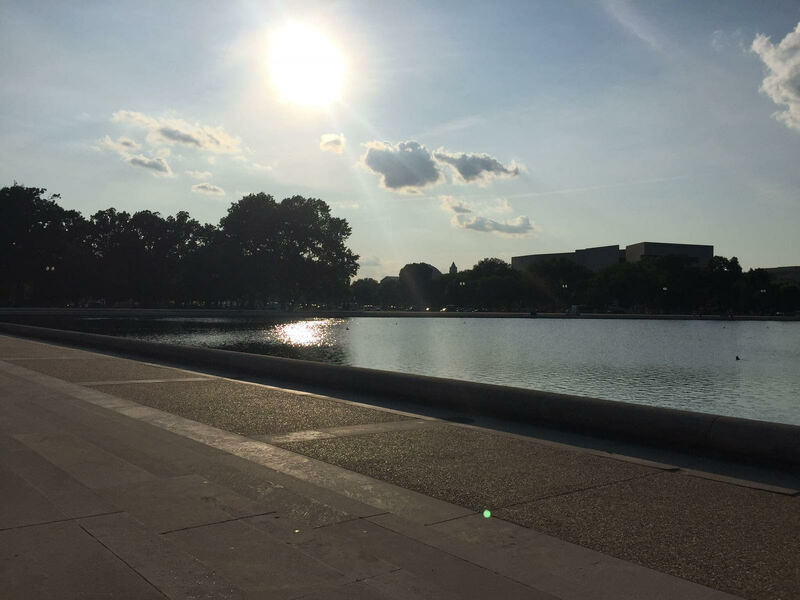 It has a distinctive parking area, followed by a small park overlooking the lake. Walking on, one sees a relatively big area dedicated to BBQ purposes only and last but definitely not least- a sandy beach! It was the perfect way to overcome a heat even the AC couldn’t seem to control! 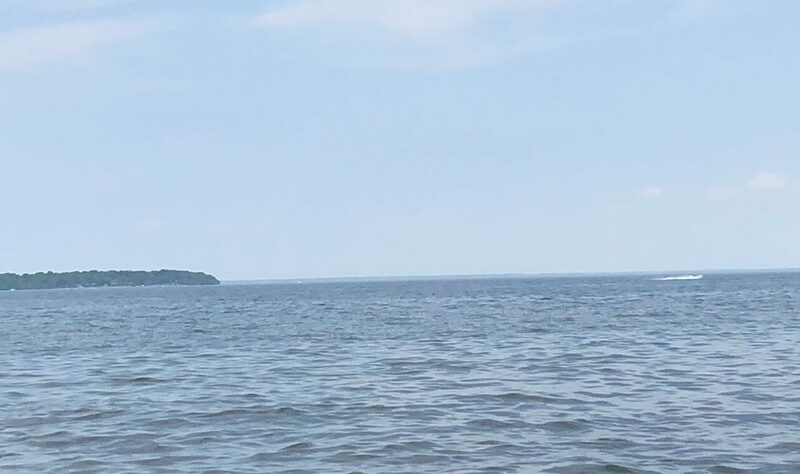 With enough privacy to enjoy scrumptious BBQ lunch; swing around a Frisbee; have water fights and craft an interesting sand castle, Innisfil Beach made the perfect picnic and nature capturing scenery! 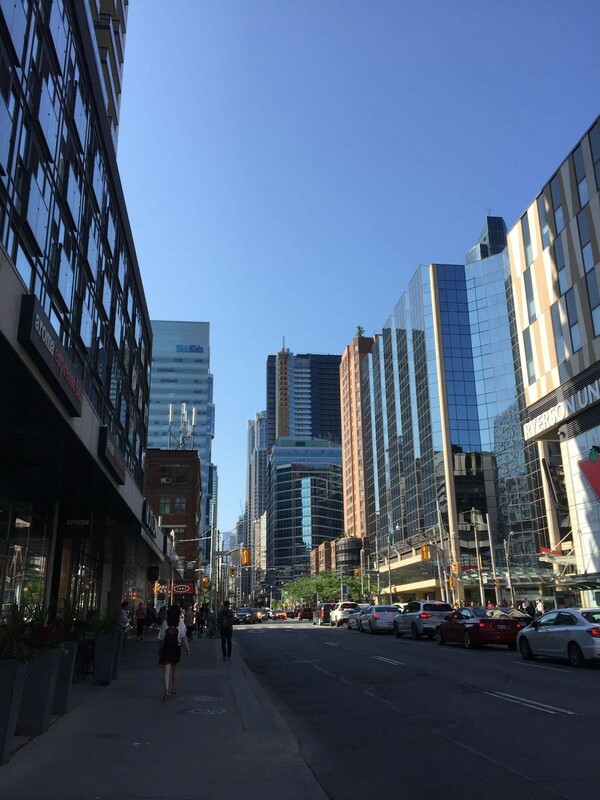 High-reaching buildings, heavy traffic, and lovely people; Downtown, Toronto is a must! A city center filled with eye-catching monuments which cannot be missed. The best experience is caught if one walks through the city and becomes familiar with its culture and beauty. 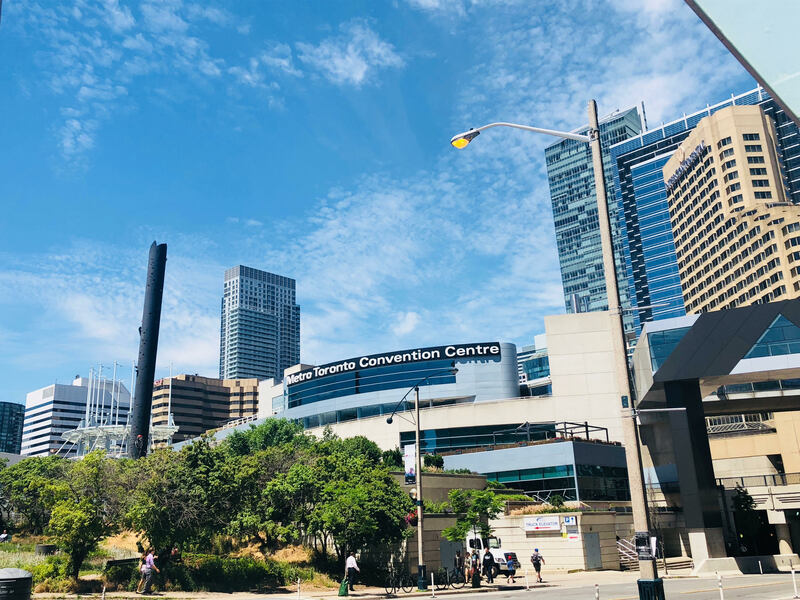 We walked a full day starting our journey at Ripley’s Aquarium walking to various destinations including Nathan Phillips Square (acting as a forecourt to the Toronto City Hall) and the famous Dundas Square to make a round trip to Eaton Centre and gain a Canadian mall experience. 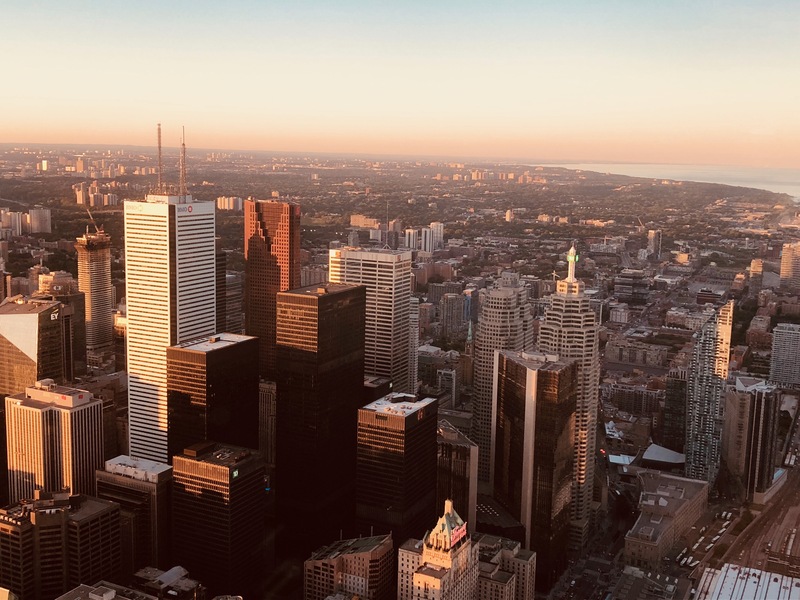 Similar to London, Toronto is a multi-cultural city, one can easily choose different cuisines to dine at and you’re sure to come across people from different religions, ethnic backgrounds, and nationalities. 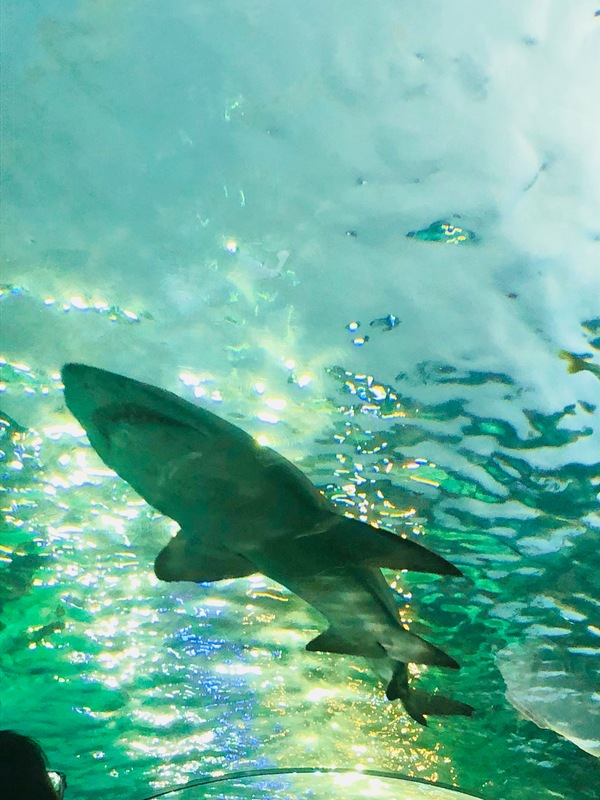 Ripley’s Aquarium is a place one must visit on their trip to Canada. It is a fascinating adventure for children and adults. 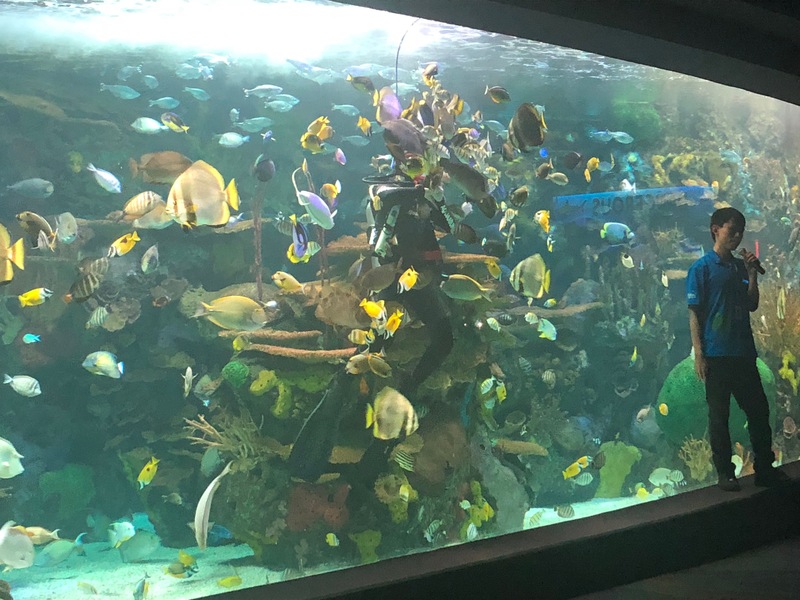 Not only are thousands of sea life species collected and beautifully kept in habitats throughout the Aquarium to adore and learn about. 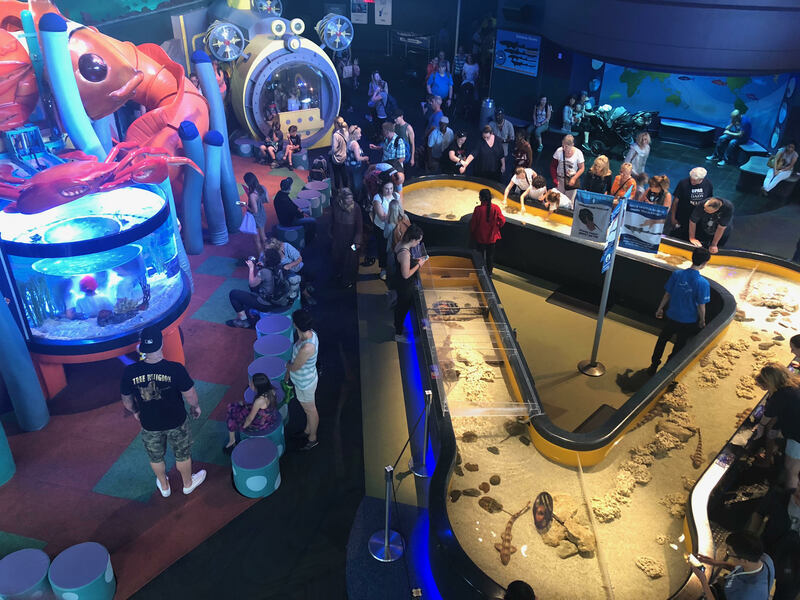 Interesting talks are held to help understand the steps we must take to save under-sea animals but also their habitats. 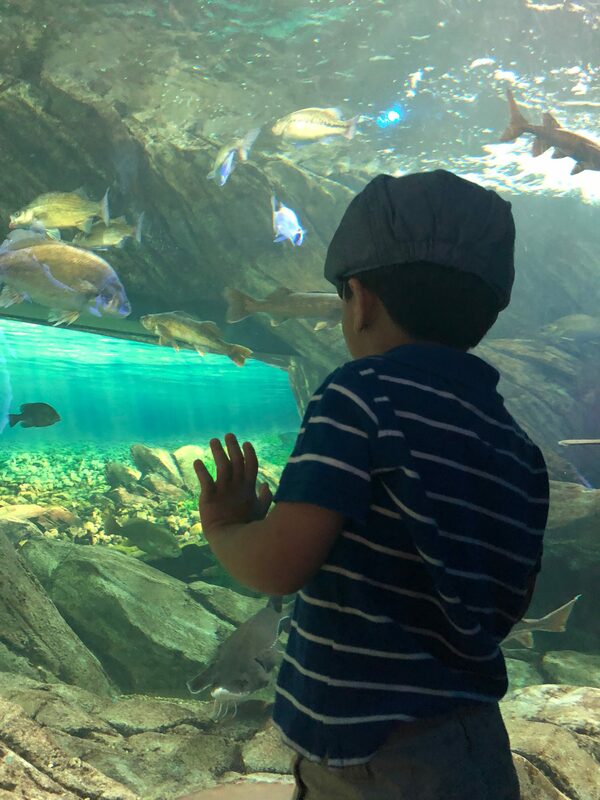 Children can run around in the bright-coloured spacious environment, feel various sea life species and try their hands at a number of interesting experiments set up in each gallery throughout the Aquarium. Take pictures, make videos, learn and adore sea life as close as never seen before! And if that doesn’t sound enough, how about visiting the gift job, where I bought a beautiful wooden shark which my nephew and I later, assembled and painted together. From stuffed toys to puzzles, Ripley’s sure has it all! The famously known CN (Canadian National) Tower is a tower standing 1,815.3 feet tall. Being the ninth tallest free-standing structure in the world. 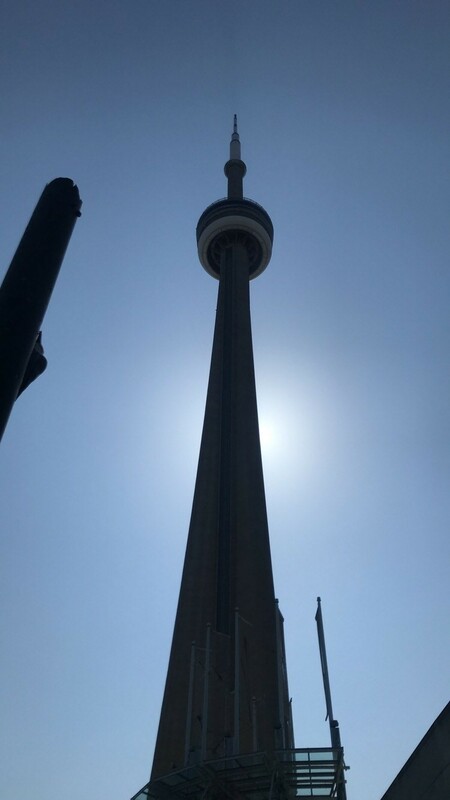 For those who do not have enough time to visit most parts of Toronto, visiting the CN Tower is an excellent way of overlooking Toronto City and breath-taking sights of sunsets, aeroplanes landing up close and busy trains passing through the city. The CN tower has plenty of spaces to sit and eat, from in-built restaurants. It provides exciting views at each level. 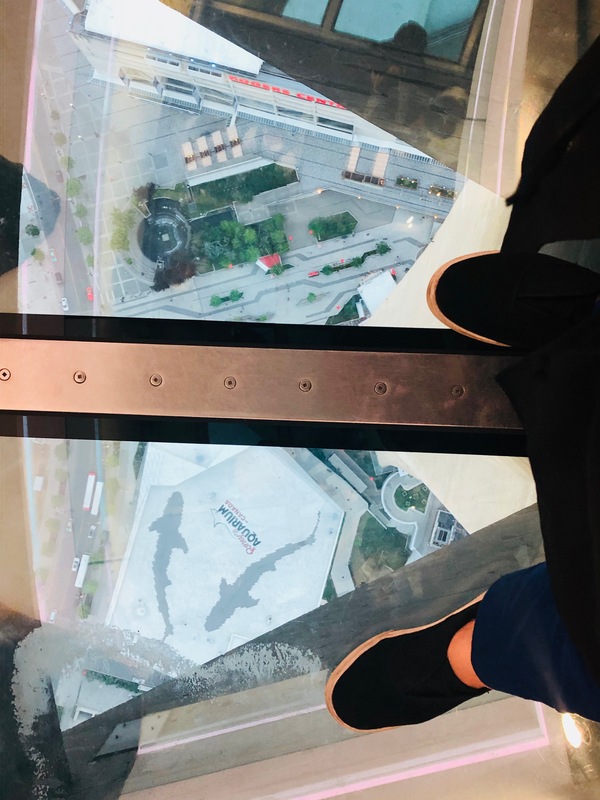 The staff takes visitor’s over 300 feet over-ground where visitors have the chance to walk around its globe and adore the city or walk over the glass floor and step out into a very safe gated Terrace. We decided to go to the Terrace, sharp at sunset. 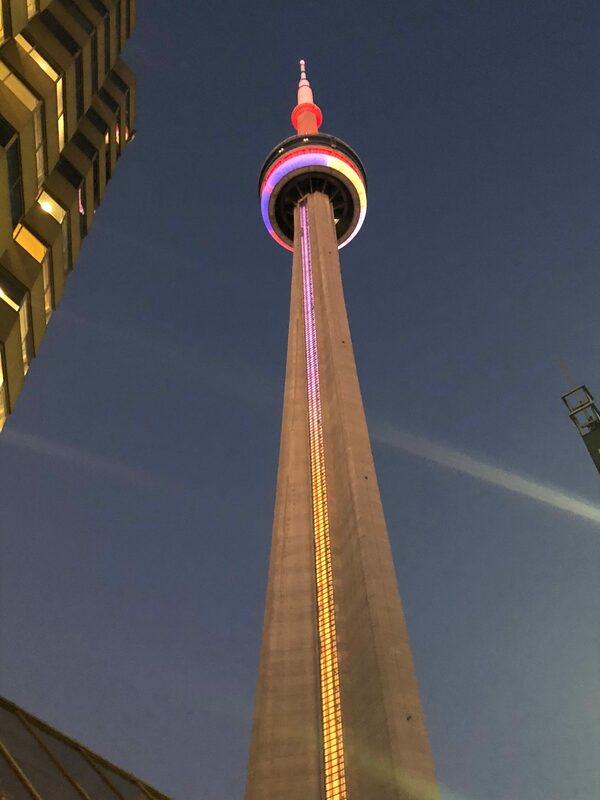 Anyone, planning to visit the CN tower should do the same! It was a view one cannot miss and capture in their eyes forever. 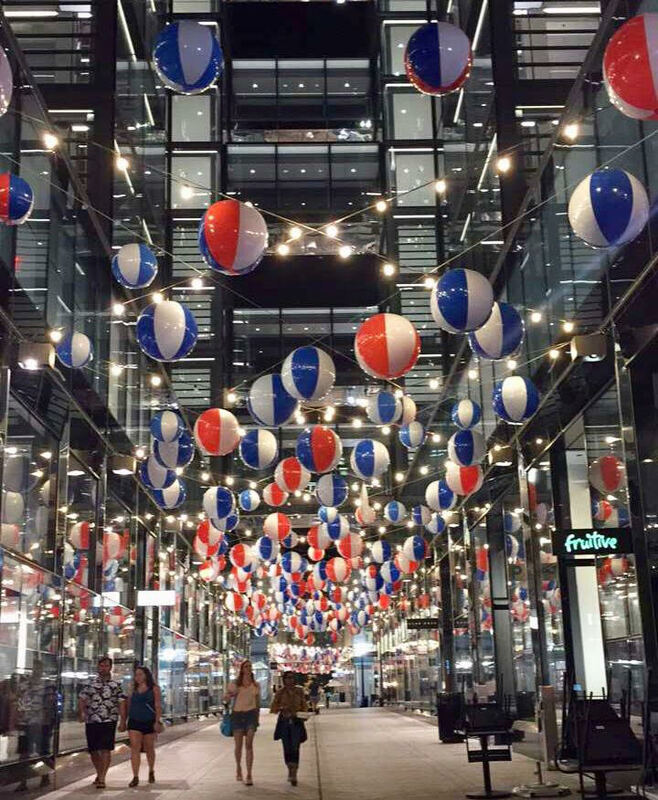 Anyone not fond of stepping out can also make the best use of the ceiling mirrors and take pictures for the memory of their trip. When visiting Canada, seeing mountains, rivers and lakes, was one of the desires which had to be fulfilled! 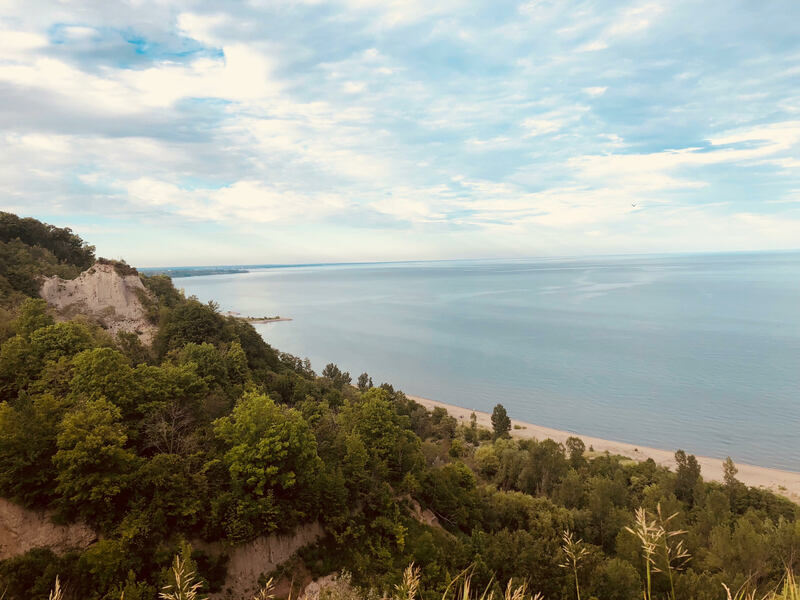 I visited Scarborough bluffs, which are beautiful cliffs overseeing Lake Ontario. This sight was not only full of surprise but also a description of the thought, Allah is the best of all creators. To reach the cliffs, we walked through a small jungle crossing through a narrow way which opened itself to the edge of a cliff illustrating a sight which seemed as though the sky and sea unite at this place. 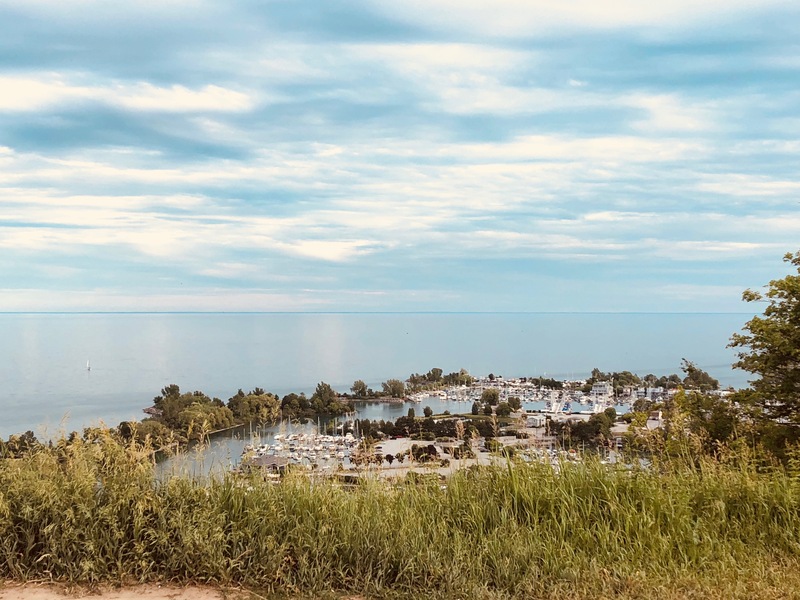 Clear skies and the blue sea with bright greenery and fine crafts of spits and cliffs, this is the beauty Allah the Almighty has hidden in the city of Scarborough, Canada. Like, any other person visiting Canada, it was a must for me that I make the most of the shopping experience in Canada. Being able to purchase clothes and other accessories at more decent prices, was definitely a delight to my eyes and wallet! I made a few trips over the course of three weeks to Vaughan Mills shopping centre, as it was relatively close to where I was staying. Vaughan Mills exposes you to various shops and places to eat. This is where I had the opportunity to try my very first Sushi dish and the famous Canadian dish: Poutine, which are fries covered with gravy and cheese. 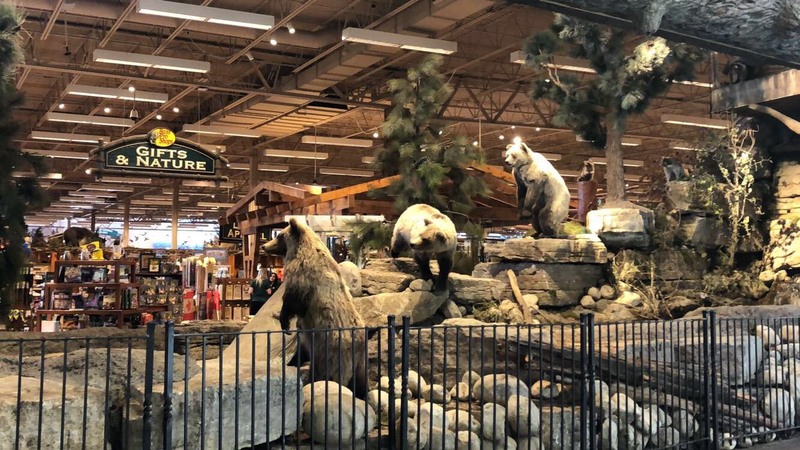 Toronto Premium Outlet is also an excellent choice for anyone in areas around Milton, wanting to explore different retail options in areas or spend a lovely day out with family. With an inclusive but open space, every shop stands out well and demonstrates a safe and peaceful environment. It provided great sales and options to buy clothes for kids and adults of all ages. 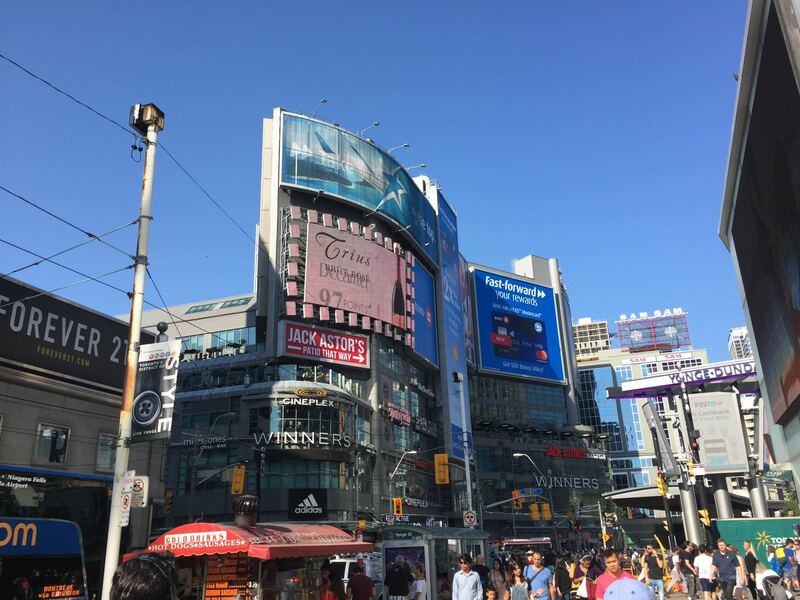 High-reaching buildings, heavy traffic, and lovely people; Downtown, Toronto is a must! A city center filled with eye-catching monuments which cannot be missed. The best experience is caught if one walks through the city and becomes familiar with its culture and beauty. 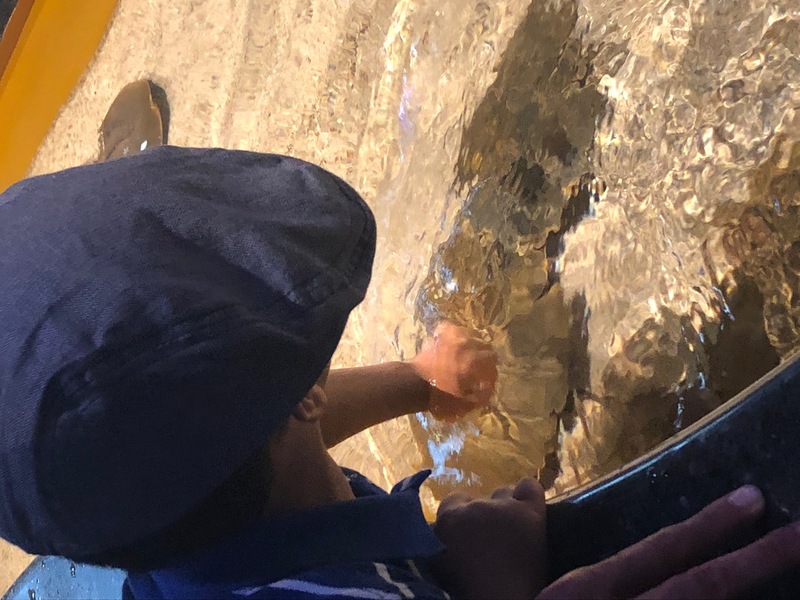 We walked a full day starting our journey at Ripley’s Aquarium walking to various destinations including Nathan Phillips Square (acting as a forecourt to the Toronto City Hall) and the famous Dundas Square to make a round trip to Eaton Centre and gain a Canadian mall experience. 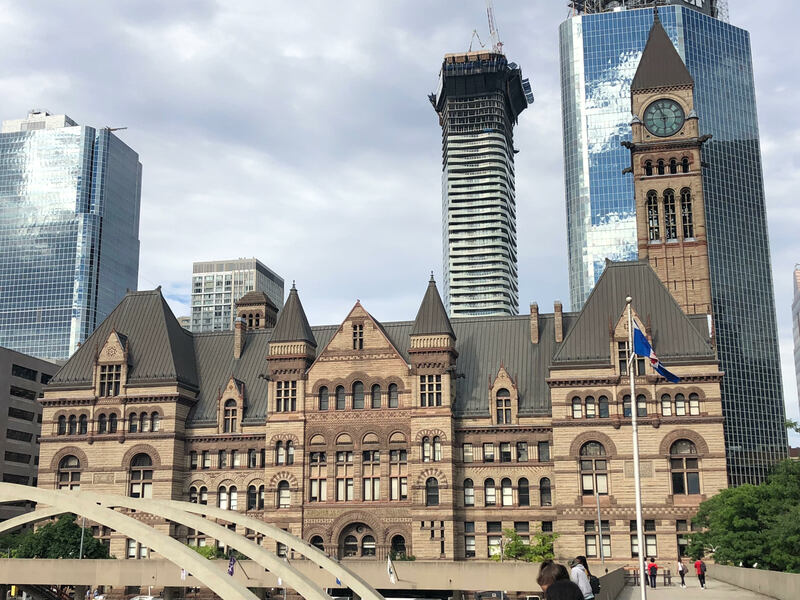 Similar to London, Toronto is a multi-cultural city, one can easily choose different cuisines to dine at and you’re sure to come across people from different religions, ethnic backgrounds and nationalities. The Niagara Falls is one of the most visited tourist attractions in the world with over 14 million visitors each year. 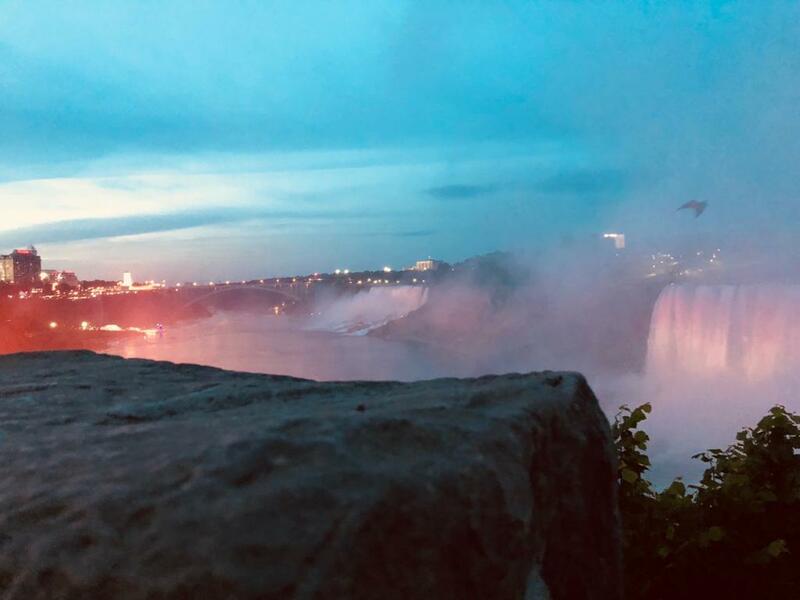 The Niagara Falls are located between the twin cities of Niagara Falls, Ontario, and New York, consisting of three different falls, the American Falls, Bridal Veil Falls, and Horseshoe Falls. The Horseshoe Falls are located on the Canadian side while the others are located in New York. The Niagara Falls was the most anticipated aspect of my trip and something I had been looking forward to since I was a little girl. Waterfalls have never failed to amaze me. The beautiful natural flow of water to such depths makes them a fascinating sight. My stay was in the Ahmadiyya abode of peace where my mums Aunt lives in Toronto. We began our journey in the afternoon around 12pm, as the journey was one and a half hours long. The weather was beautiful and it was incredibly sunny with temperatures going to 35 degrees. 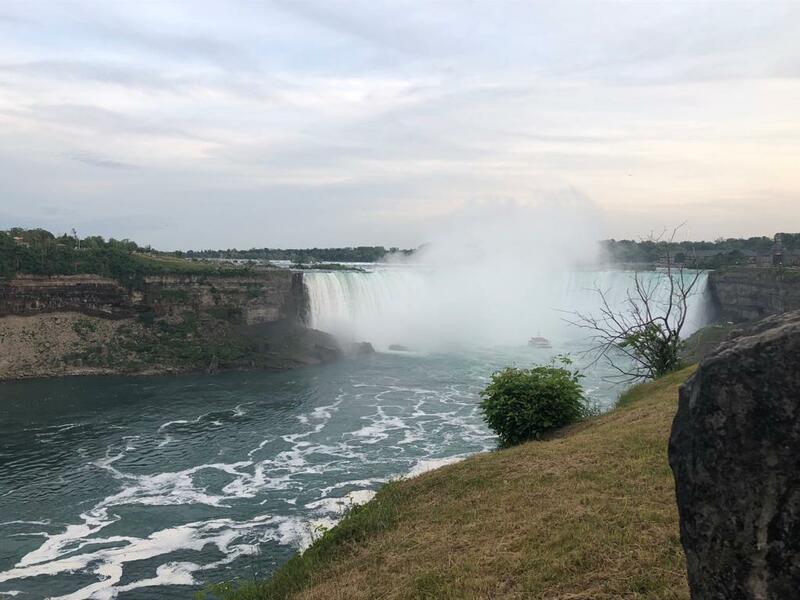 Once we arrived at the Niagara Falls, after parking up, we began the trip with some cold iced frappes from Tim Hortons, a very well known and popular café in Canada. 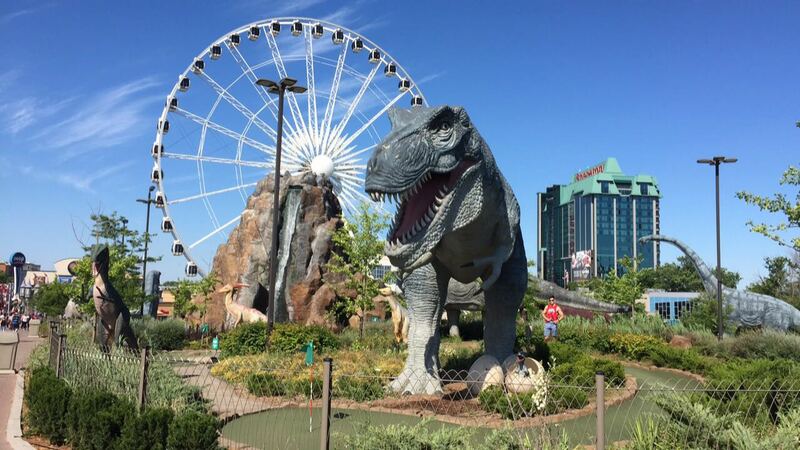 The Niagara Falls attraction is made up of a small funfair with many restaurants and cafes surrounding the area, leading to the waterfall. As we took the last stride towards the waterfall, I tried to keep my eyes down to ensure I would only see the magnificent sight once it was right in front of me. I opened my eyes to one of the beautiful and scenic places I had ever seen. The noise of the water rushing down with such force embraced my ears and the pleasant rush of breeze across my face made me close my eyes and lean my head forward. I took a while just letting the pleasant sound of the water and the breeze play at my ears, as I turned my head to take in the whole view of the falls. Saying I was “mesmerised” comes somewhat close to describing how I felt standing in front of one of the world’s most beautiful places. After taking many photos of the view which in no case did justice to the actual beauty of the falls, we went to queue up for the boat ride of the falls. I saw people drenched in water as they were leaving the boat, wearing disposable jackets with caps. We were each handed an orange jacket which we put on as we got into the boat. 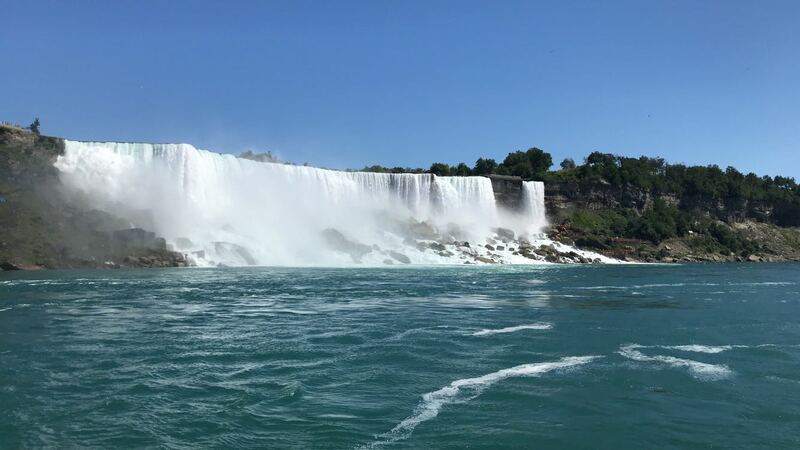 As the boat started moving we could view the Niagara fall from a different angle from the bottom and see the rush of water falling down, giving off white smoke. As we neared the center of the falls, we felt light spritzes of water fall on our faces. The wind got harsher as we started getting wet with heavy droplets of water the nearer we moved to the falls. The boat took us right up close to the centre of the falls at which point we were all drenched in water from head to toe. 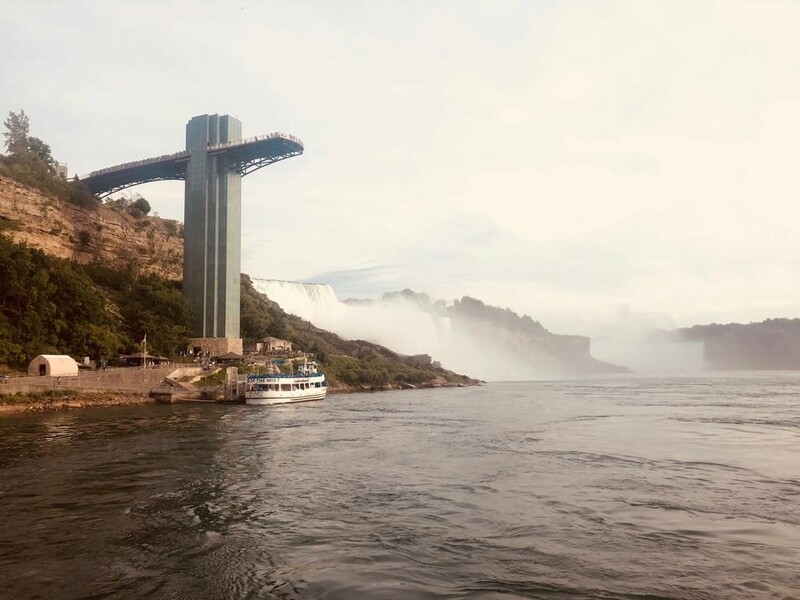 I quietly stood at the edge of the boat looking up as far as my eyes could reach to take in the falls and the white smoke. The boat then turned, and we started distancing from the falls. I turned to face the waterfall one last time to take in the last few moments of being at such close proximity. Once we got off the boat, we roamed around the funfair for a while, enjoying the colourful setups and displays before having a scrumptious lunch of burgers and fries at Wendy’s. We decided to walk back and stand at a different point to view the falls and take some more photographs. For me, I just wanted to cherish a few more moments quietly as I stood and watched the falls. It was definitely a day I will not forget, and I have wonderful memories and pictures to take me back to this trip, allowing me to cherish it forever. Our arrival in the USA was a little more complicated and delayed than was expected. Having missed our direct flight to Washington, we were handed alternative boarding passes for a connecting flight from New York to DC. A further misfortune was the fact that our beloved Aunty had boarded our initial flight… without us. It’s safe to say the air hostesses got an earful once she realised they were nearing take-off and she was still seated amongst three empty seats. On the other side… we sat watching from behind the airport windows as our flight began to take-off… praying our Aunty was alright. Nevertheless, eventually we reunited at the DC International Airport and it’s safe to say, we had never been happier to see our Aunty. 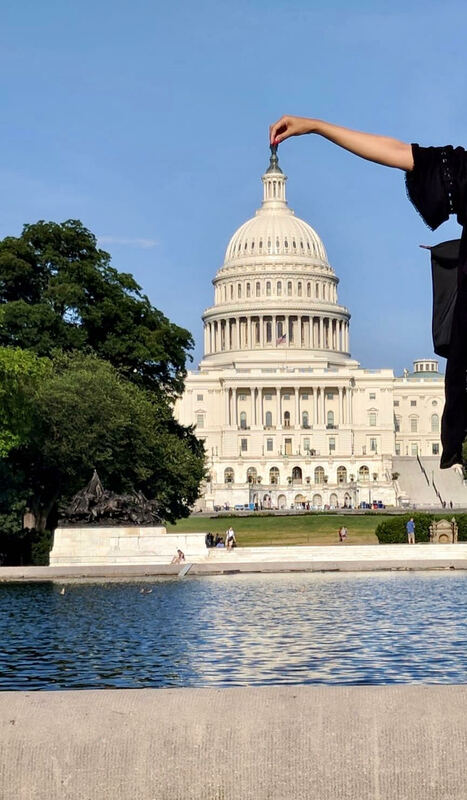 The rest of our stay in DC was eventful, to say the least. We stayed with my Aunt’s family in Maryland, who are extremely blessed to have a house right by Bait Ur Rehman Masjid. Taking us from central DC to every shopping mall possible, our family sure kept us moving and entertained. Seeing the White House in real life felt surreal, although it was rather difficult to get a good glimpse of through the dozens of security measures surrounding it. Capitol Hill as we hear it in all the American shows, had the inner tourist in me going wild- it felt as though I could finally draw a personal connection to all the American TV I had watched. The food and the portion sizes lived up to their expectations and certainly did not disappoint! With the grace of Allah, we also had the opportunity to attend our second Jalsa of the year after having attended Jalsa Salana Canada only a few days prior, we were now blessed to be making our way to Pennsylvania for the 70th Jalsa Salana USA 2018. 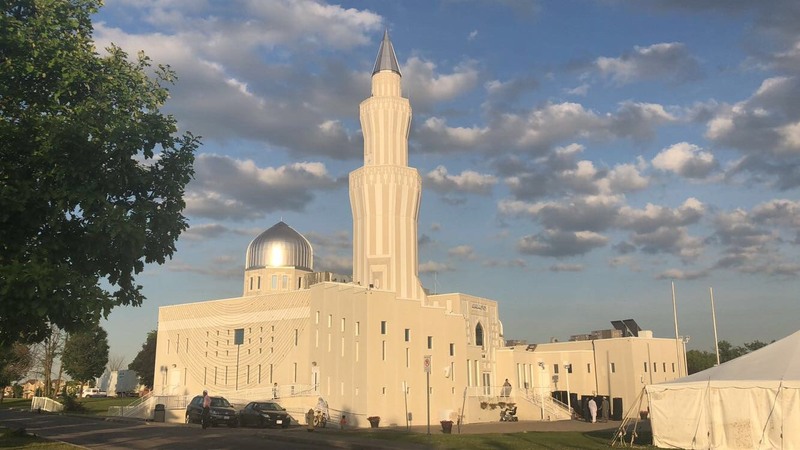 The American Jalsa Salana was a different kind of experience altogether, but regardless, the sense of familiarity I felt despite being from across the globe, remains very close to my heart. From sitting amongst sisters listening to the inspirational speeches, having duty holders request us to stop talking, estimating what toilet queue will end faster, to queuing up for the delicious langar food; the sense of familiarity was comforting, to say the least. But that is the blessing of our Jamaat, no matter which part of the world you travel to, you know one thing will always remain the same, and that is the love and unity of Khilafat. Alhamdullilah for a mesmerising trip. it with a new preprinted month!! Take a piece of gold foil cardstock, cut the cardstock to fit your clipboard…so easy!! Using some craft glue; glue everything down to the clipboard!! To make the Post-It note holder, use 3/4 inch elastic and wrap it around the Post-It notepad until it is snug but not too tight. Remove the notepad. While keeping the elastic in the same spot staple the ends together. 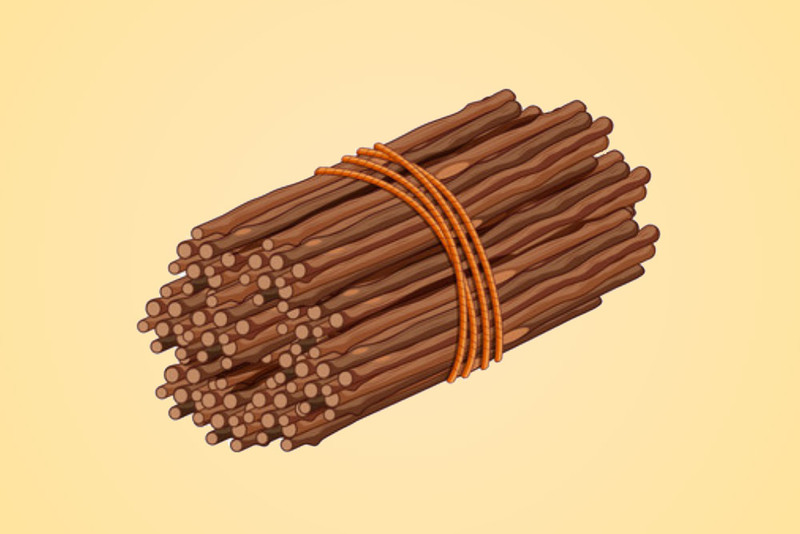 Now you should have a bracelet type shape from the elastic. It should be just tight enough to hold the sticky pad. Using your hot glue gun secure the elastic to the clipboard. If you use the pop up Post-It notes you won’t have to remove the entire pad every time you need a new sticky note…. pretty cool!! Use a small metal tin and hot glue it to the clipboard. It is the perfect spot for small desk items. To make the pencil holders just use some craft paper tags with pockets. The paper is thick enough to withstand holding a few items per tag. Perfect place to store your dry erase markers and scissors! These were all secured with the hot glue gun. Use hot glue gun to secure the metal clips in place. 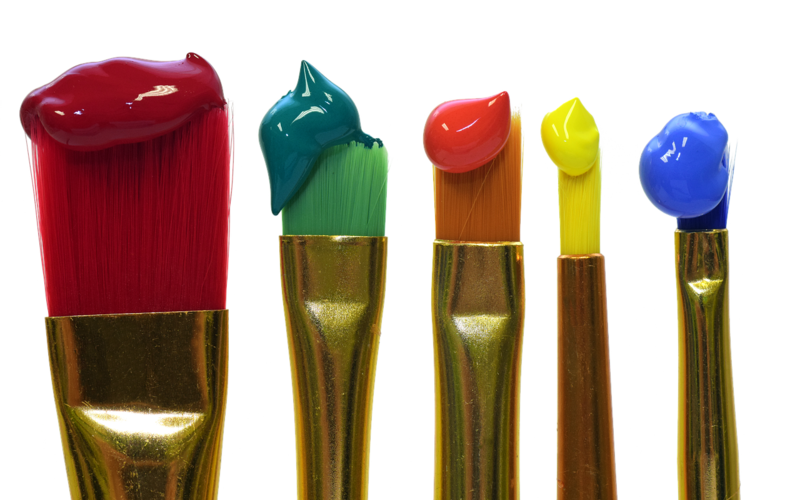 Send pictures of your creation for a feature in Ayesha Magazine or on the Nasirat Website. Use a piece of cardstock that comes printed with a calendar already on it. You certainly could use a pre-made calendar or find a printable. Cut it down to size to fit on the clipboard. After each month is over replace it with a new preprinted month!! Tahajjud prayer is a type of optional, voluntary prayer (Nawafil). 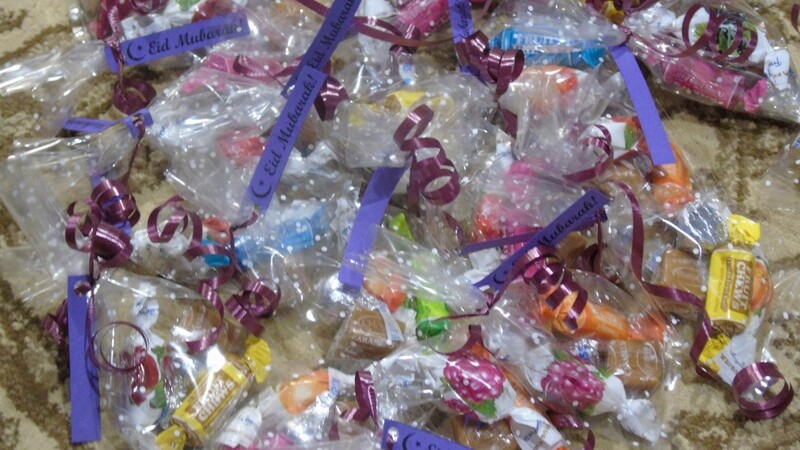 It can be offered individually or in a congregation. Tahajjud prayer is offered in the late hours of the night. The time for Tahajjud prayer starts after midnight and ends when the time for Fajr prayer starts. To offer Tahajjud prayer, one has to go to sleep after Ishaa prayer and wake up at night to pray again. The Holy Prophet (pbuh) used to offer Ishaa prayer and then go to sleep, waking up again just after midnight to pray Tahajjud. To make up for that sleep, he would usually then take a short nap in the afternoon. How many Raka’at is Tahajjud prayer? What are the benefits of Tahajjud prayer? Tahajjud prayer is a way of becoming close to Allah Almighty. Tahajjud prayer allows you to gain Allah’s special favours as prayers that are offered in Tahajjud are more readily accepted by Allah. One becomes closer to Allah when offering Tahajjud prayer as he/she gives up sleep and the comfort of a bed to pray to Allah Almighty. Although it is not obligatory, it is very strongly emphasised by the Holy Quran. It has always been the practice of the pious people to perform this Prayer regularly in order to gain Allah’s special favours. The supplication made during Tahajjud Prayer are granted acceptance by God Almighty readily. It is also a vehicle for achieving nearness to God, because at that hour, one gives up sleep and forsakes the comfort of one’s bed, to fall prostrate before one’s Lord. 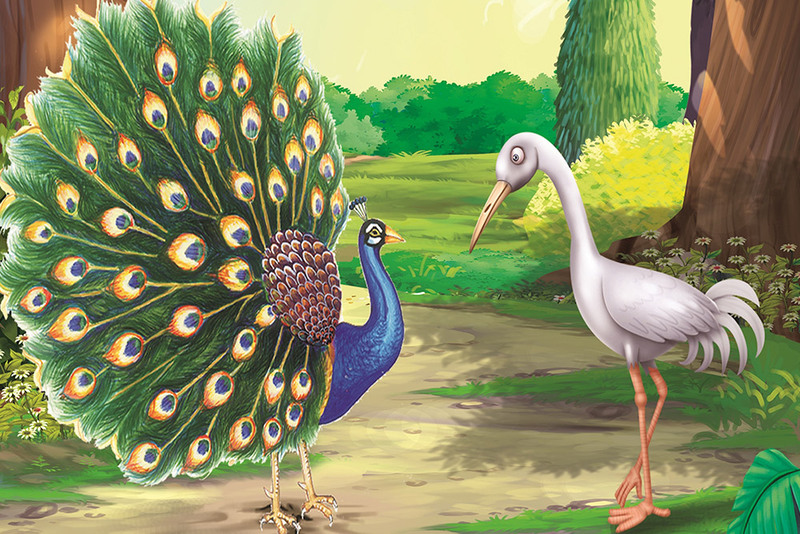 The Fox and the Stork became very good friends. One day, the Fox decided to invite the Stork for dinner. The fox prepared a delicious soup, but, as a joke, presented the soup in a very shallow dish. When the stork arrived, the fox happily lapped and licked up the soup, but the stork could not do anything except wet the very end of her beak in the soup, without tasting one drop. She left the dinner hungry, and the fox apologised that the stork had not liked the soup. The Stork waved away the fox’s apology, and in return, offered to cook dinner for the Fox the following day. 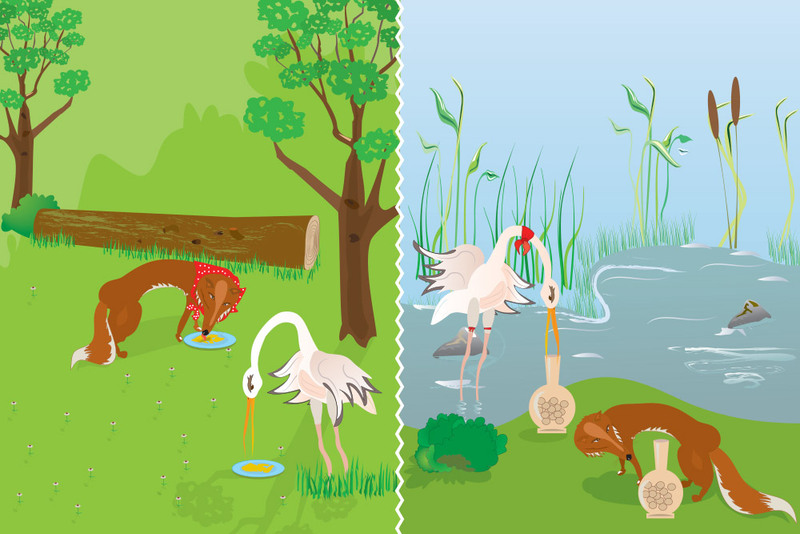 So, the next day, the Stork awaited Fox’s arrival and when he arrived, he found a table laid with two very long-necked flasks which held the meal. The stork easily dipped her beak into the food and ate hungrily, but the Fox could not fit his snout through the flask neck. The Fox left the dinner as hungry as when he arrived and had learned his lesson: One bad deed warrants another. A farmer lived with his family and had one goose, which he would collect eggs from each morning. One day, he bent over to pick up an egg, when he realised that it was hard, heavy and a glittering yellow. He almost threw it away, but instead went to show his wife. When they looked at the egg more closely, they realised that it was made of pure gold! The next day, the farmer and his wife waited feverishly for the next morning’s egg. Sure enough, the same thing occurred and the farmer soon became rich from selling his golden eggs. 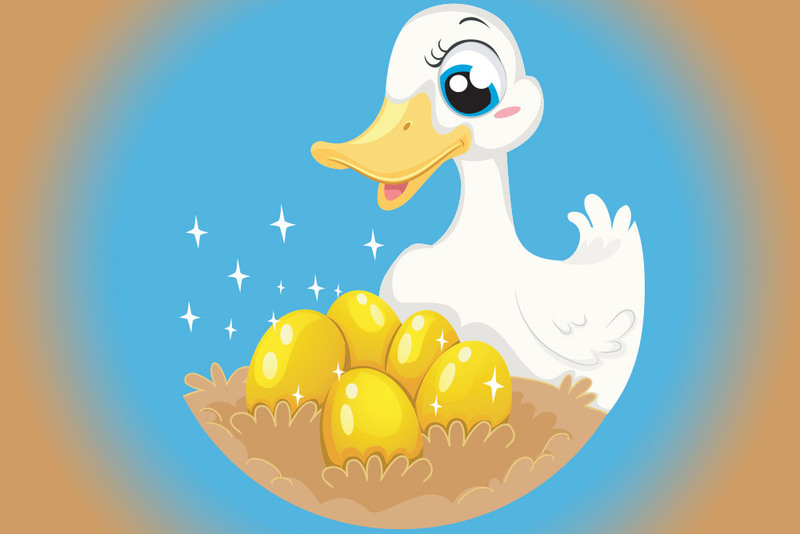 Every day, the farmer collected the golden egg from his goose and sold it as quickly as he could. The farmer soon became very greedy, and he was not happy with only one egg per day, so he decided to get all the eggs at once. He took the goose, killed it and opened it up to find the other eggs – however, he was dismayed to find nothing inside the goose. The greedy farmer lost his wealth, and he came to realise that his greed had over-reached itself, and he had suffered for his foolishness. The wind and the sun began to argue over who was the most powerful when they saw a young traveller pass by beneath them. The sun then set the challenge that whoever caused the traveller to take off his coat would be seen as the strongest. The wind agreed and blew the most ferocious winds in the direction of the man. But no matter how hard the wind blew, the traveller kept his coat clutched around him tighter. The wind finally gave up, and so the sun came out behind the clouds and shone, basking the traveller in gentle sunlight. The man quickly grew too warm to keep his coat on, and took it off, much to the sun’s pleasure. From then on, the wind understood that kindness is more effective than severity. 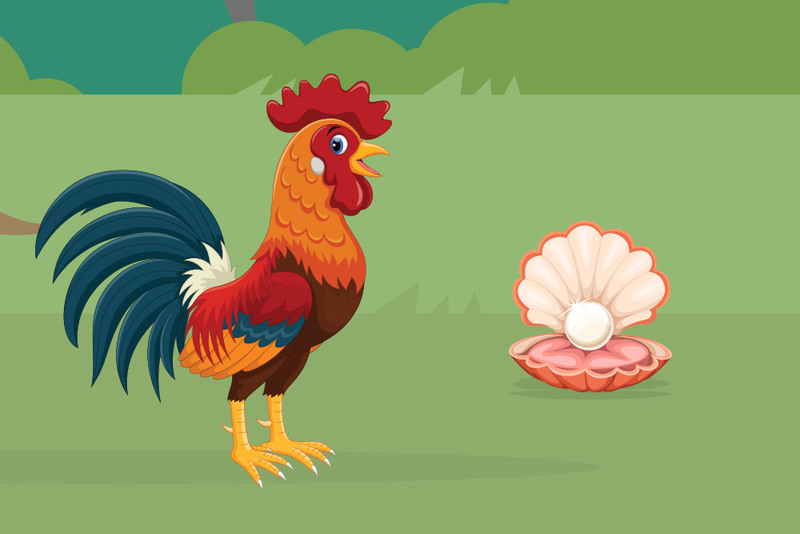 An old rooster was pecking around his home for food when he spotted something shining in the grass. Excitedly, he went to go and claim it as his own. It was a single, smooth pearl, which had probably been lost on the farm long ago. He wondered how valuable the pearl would be to his farmer, and said: “You might be very precious to men, but I would rather have a single kernel of corn than a whole basket of pearls.” He discarded the pearl to continue looking for food, as ‘precious’ things are only precious to those who can prize them. The peacock dropped her feathers and looked very embarrassed, she realised that if someone lacks one thing, they are always given another gift to compensate for what they do not have. The lion thought it was so funny that he let the mouse go. 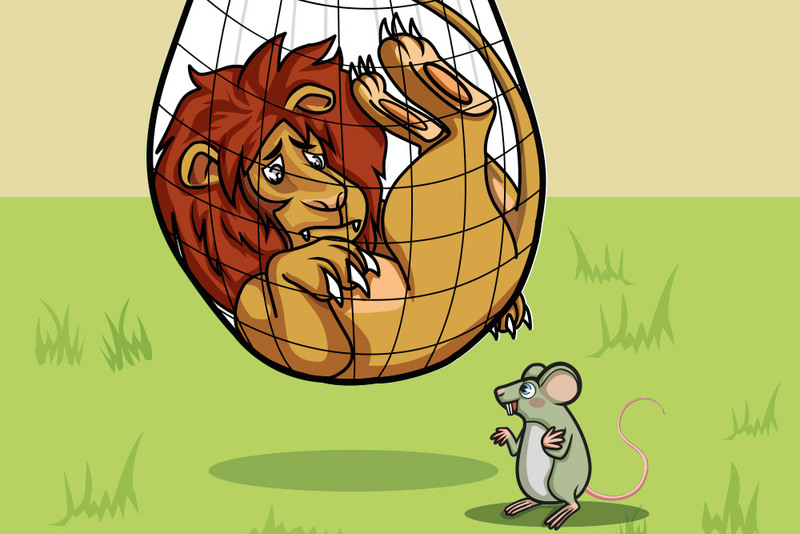 A few months later, the great lion was rambling through the forest when suddenly he stepped into a hunters net and found himself trapped. No matter how hard he struggled he couldn’t break free.